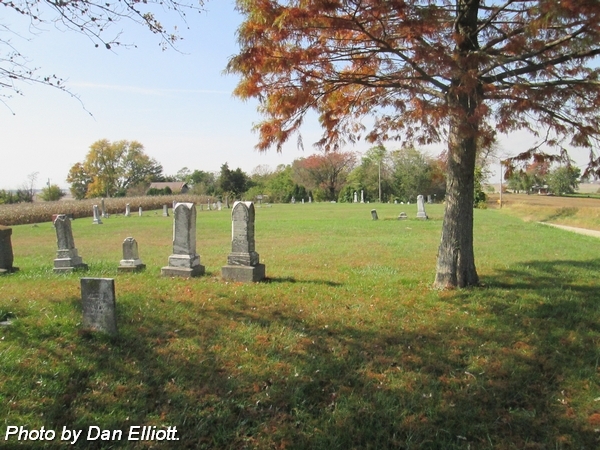 Note: The cemetery burials are roughly in three sections: East, Center and West. 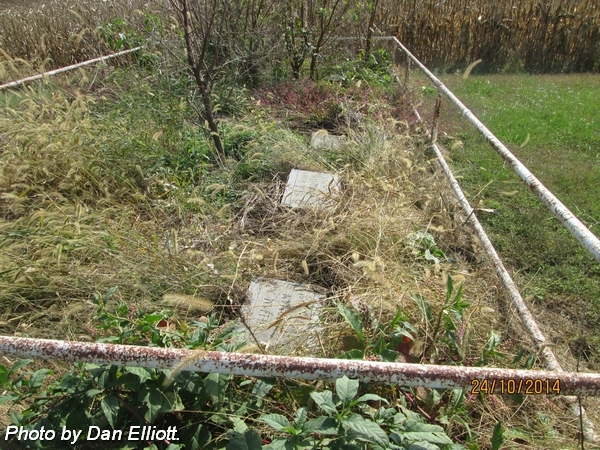 Rows were counted from the east side of each section. nee Barton. 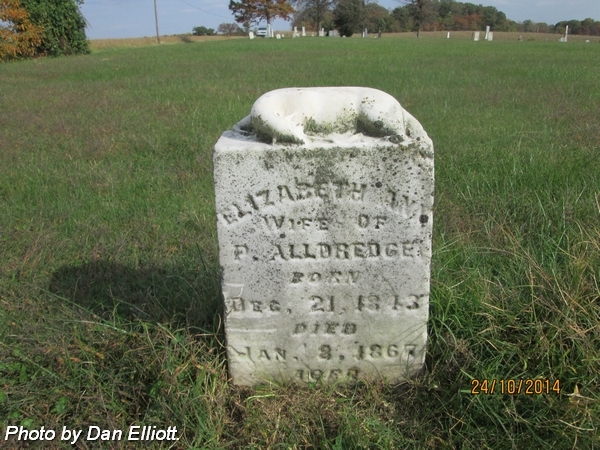 Wife of Parish Alldredge. 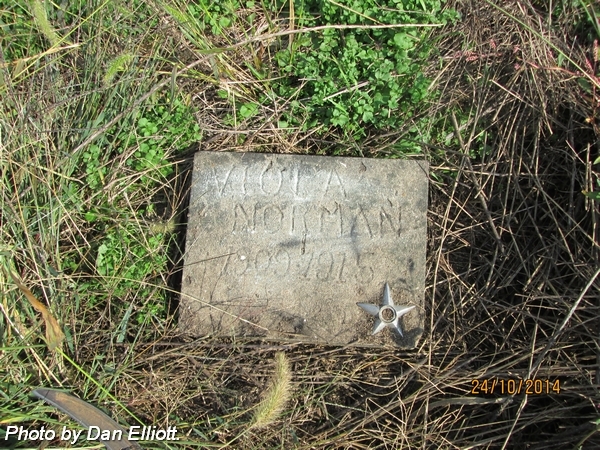 Married 1 Jan 1863. 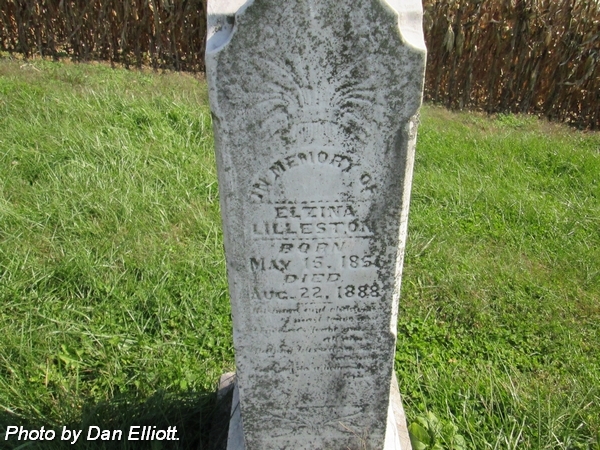 Daughter of Alfred & Christina Jane (Bell) Barton. Son of William & Missouri A (Lewis) Barnett. nee Lewis. 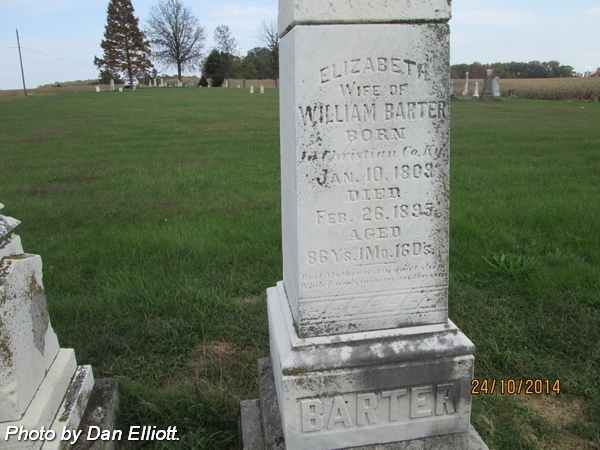 Wife of William Barnett. Married 6 Nov 1866. 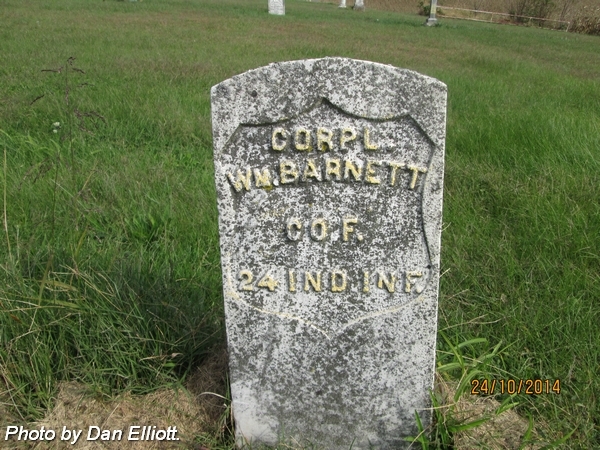 Husband of Missouri A (Lewis) Barnett. 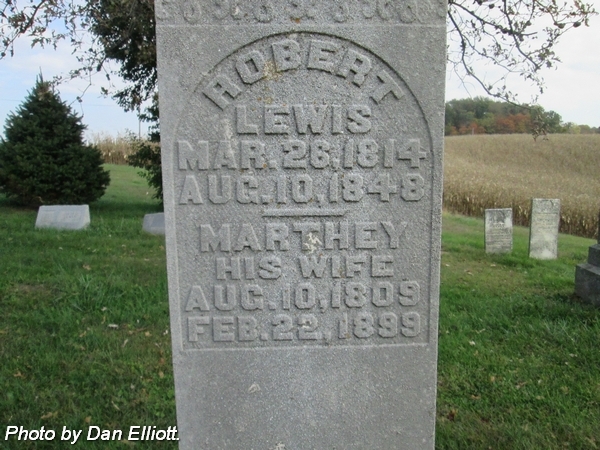 Married 6 Nov 1866. Corpl. 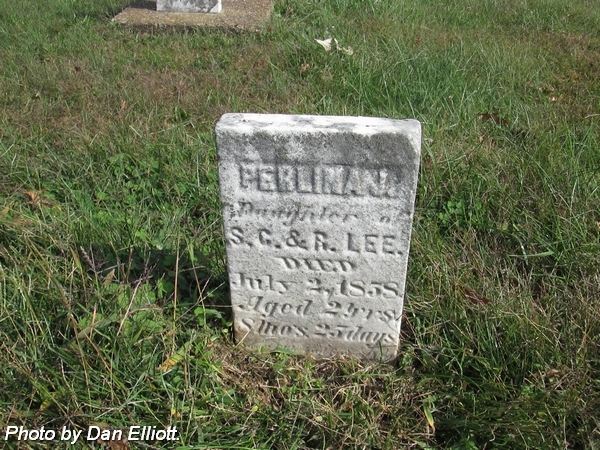 Co. B & F, 24th Indiana Infantry. Son of Job & Sarah F (Bell) Barter. nee Downen. 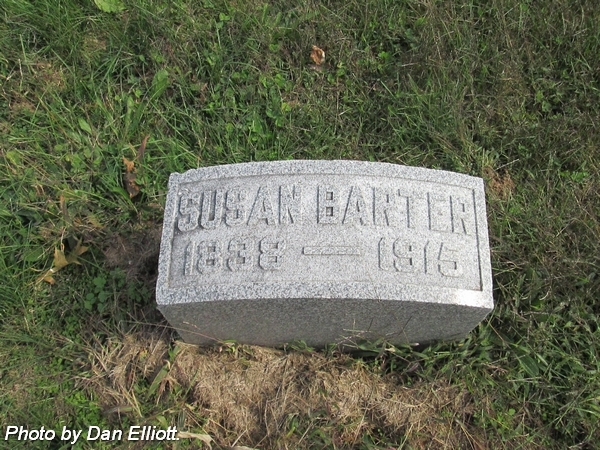 Wife of William Barter. 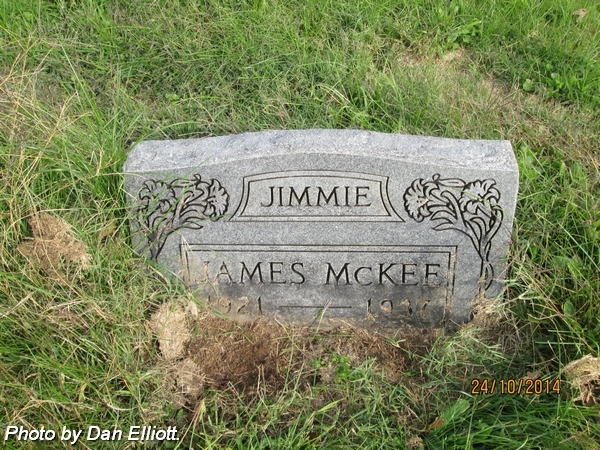 Born in Christian Co., Ky. Aged: 88 Y’s. 1 Mo. 16 D’s. 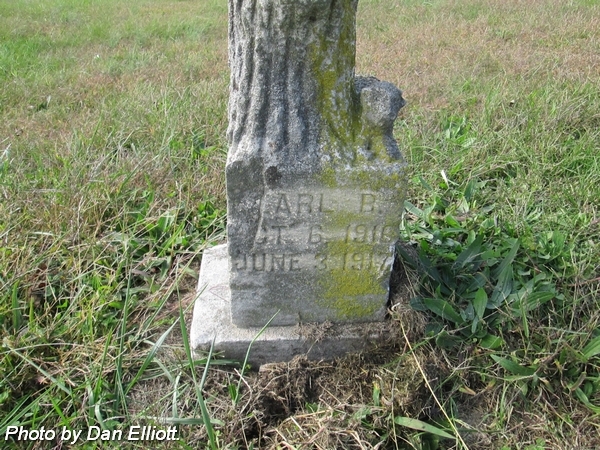 Husband of Sarah F (Bell) Barter. Married 1 May 1862. 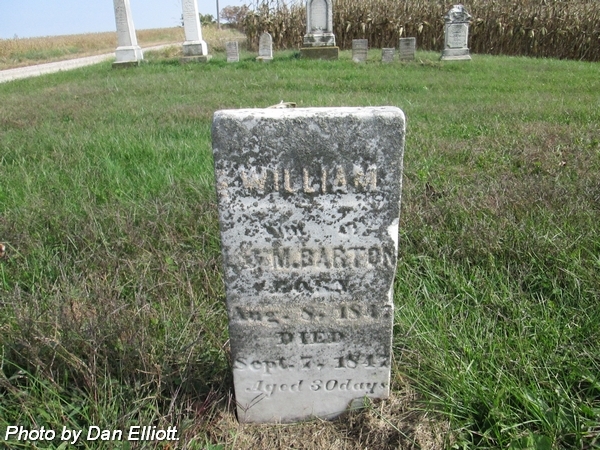 Son of William & Elizabeth (Downen) Barter. Husband of Christina Jane (Bell) Barton. Married 16 Oct 1839. 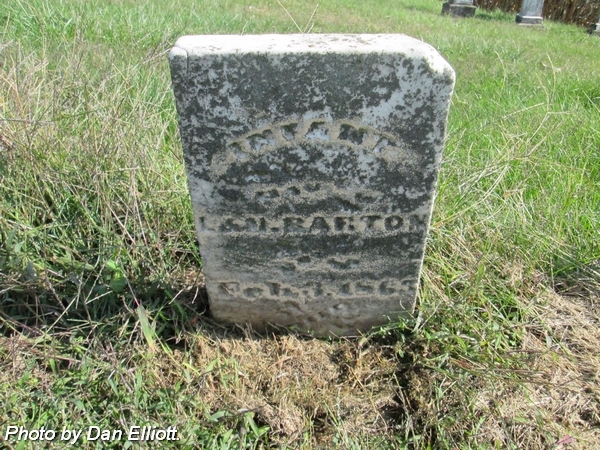 Son of Alexander & Elizabeth (Lowell) Barton. 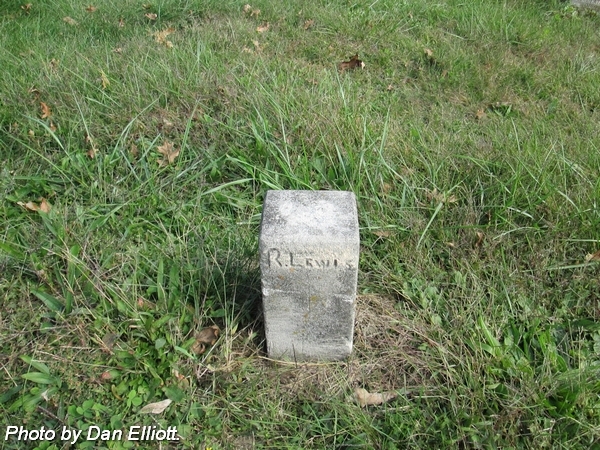 Pvt., Co. K, 10th Indiana Cavalry. nee Bell. 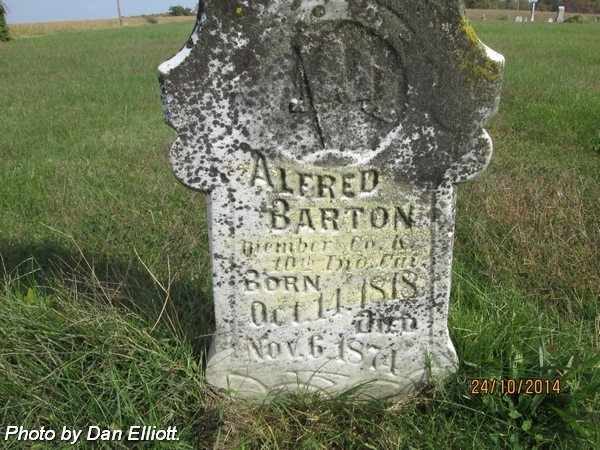 Wife of Alfred Barton. 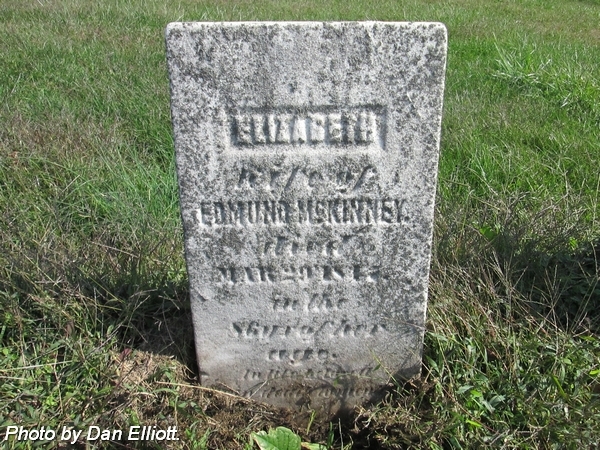 Married 16 Oct 1839.
nee McKee. 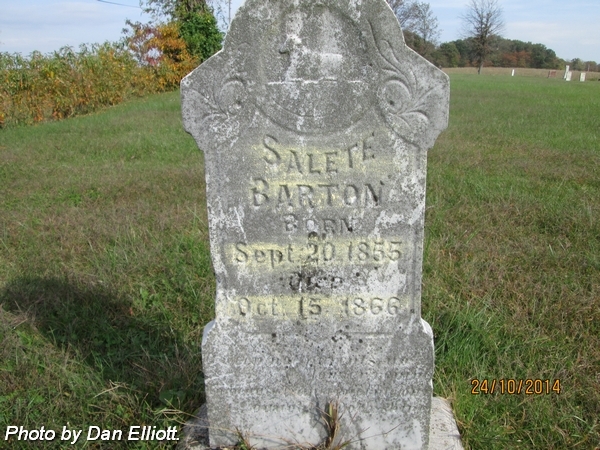 Wife of Major B Barton. Married 16 Mar 1873. 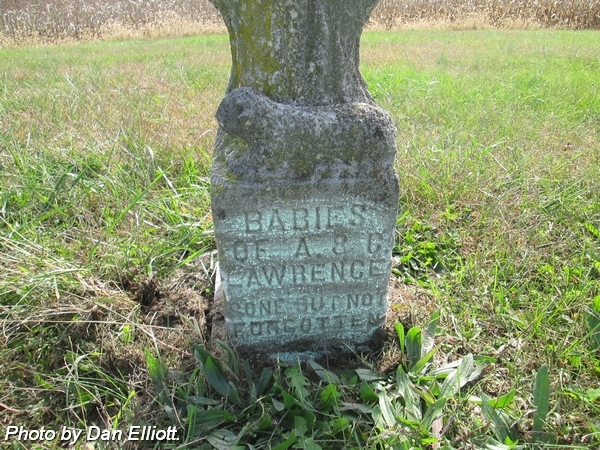 Infant daughter of Lewis & Martha (Oliver) Barton. 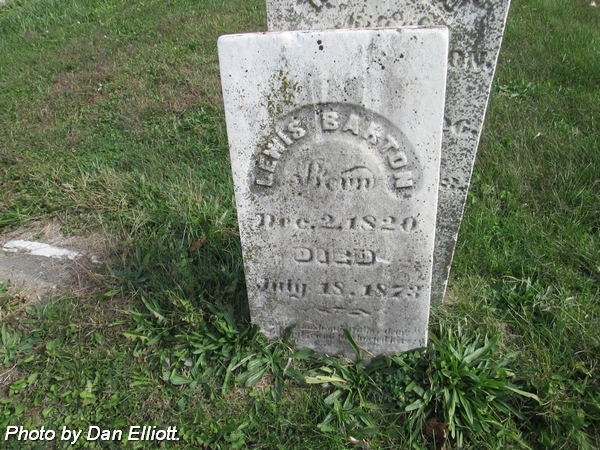 Daughter of Lewis & Martha (Oliver) Barton. 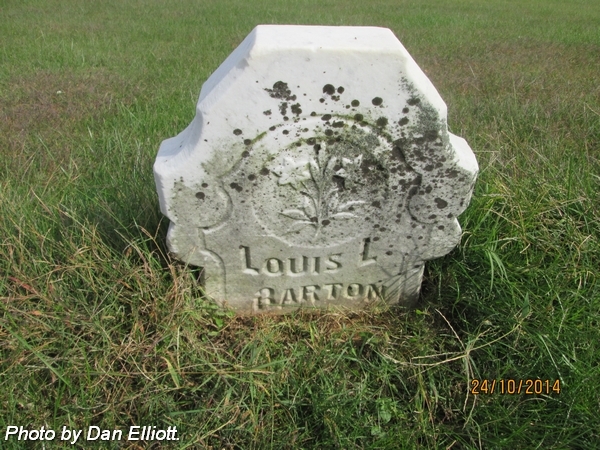 Husband of Martha (Oliver) Barton. 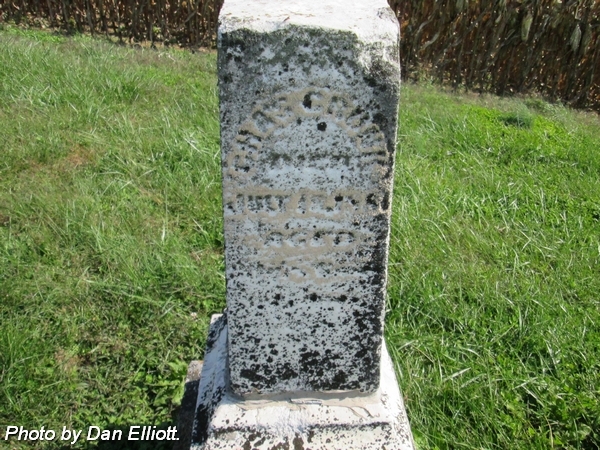 Married 24 Nov 1842. 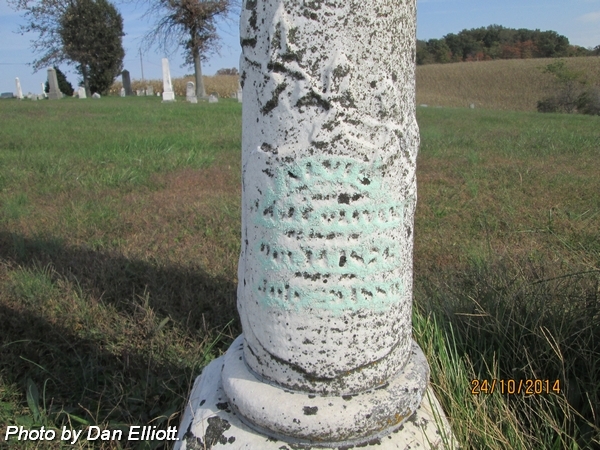 Husband of Harriet Jane (McKee) Baton. Married 16 Mar 1873. Son of Alfred & Christina Jane (Bell) Barton. 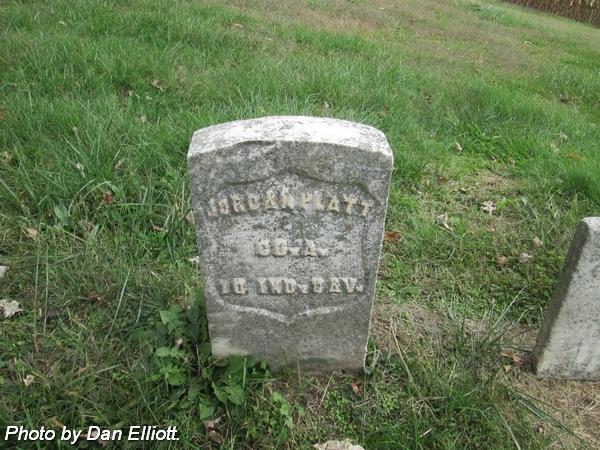 Pvt., Co. A, 10th Indiana Cavalry. nee Oliver. Wife of Lewis Baton. 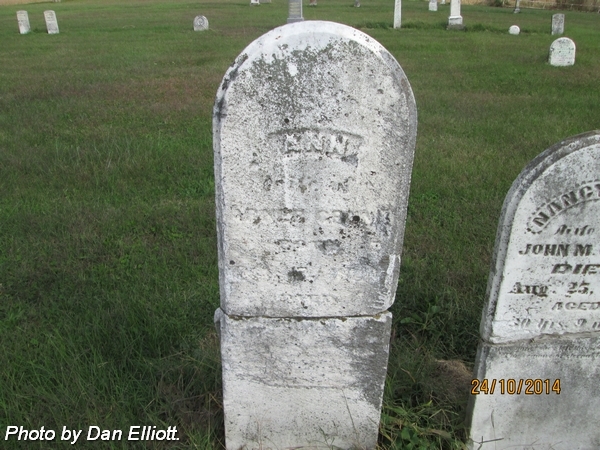 Married 24 Nov 1842. Daughter of William & Arilla (Price) Oliver. 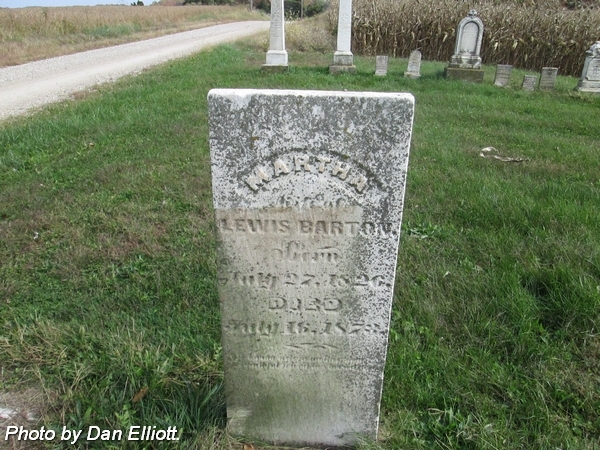 Son of Lewis & Martha (Oliver) Barton. nee Moore. 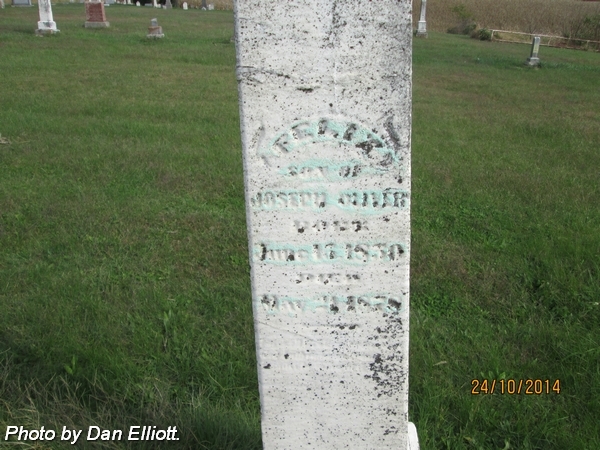 Wife of John R Bell. Married 28 Feb 1849. 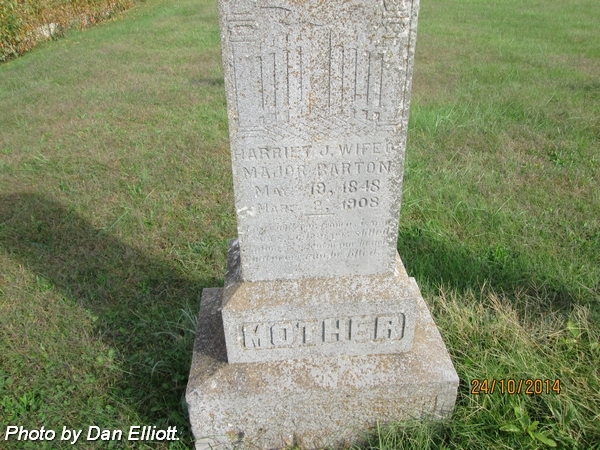 Daughter of Mathias & Mary Moore. 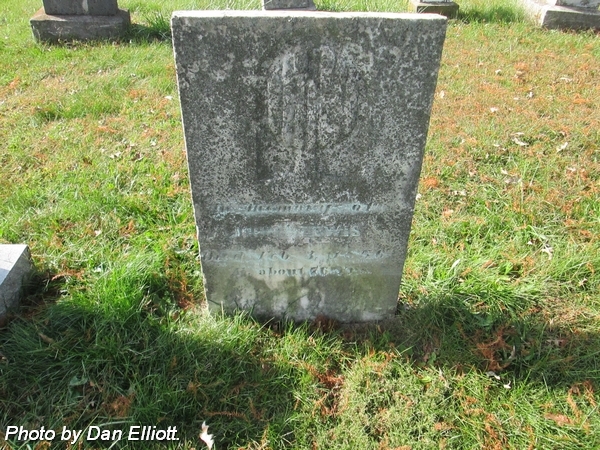 Husband of Harriett Jane Bell. Married 28 Feb 1849. 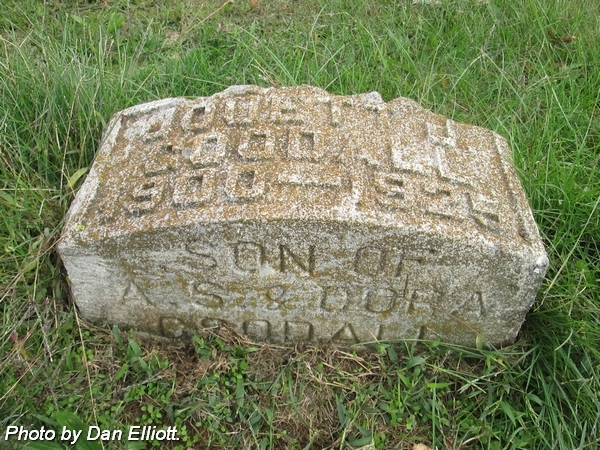 Son of John & Sarah Ellen (Quinn) Bell. 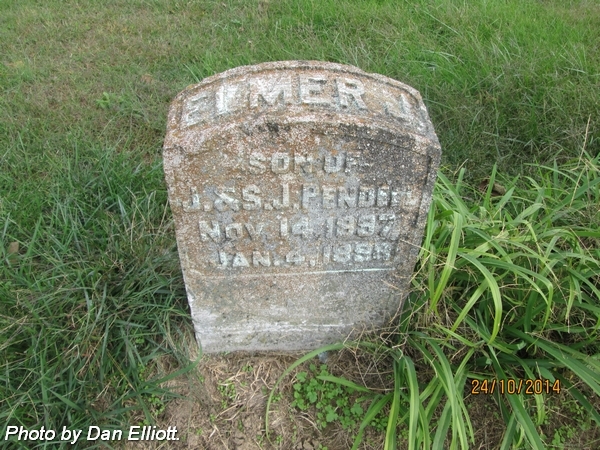 Son of Jacob & Patsy (Lewis) Benner. 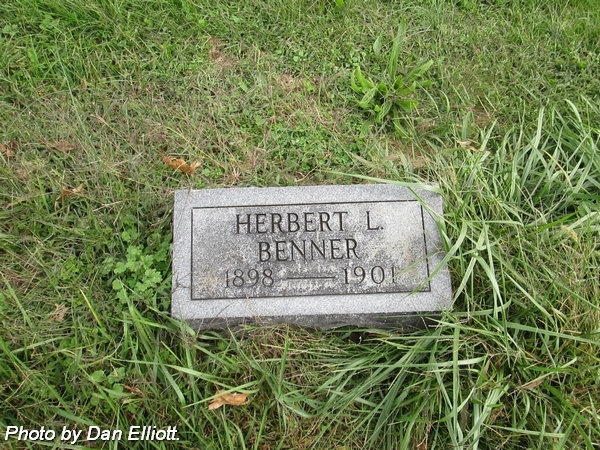 Husband of Patsy (Lewis) Benner. Married 23 May 1889. Son of Karl Charles & Minerva “Minnie” “Mina” Wilhelmina (Schlittenhardt) Benner. 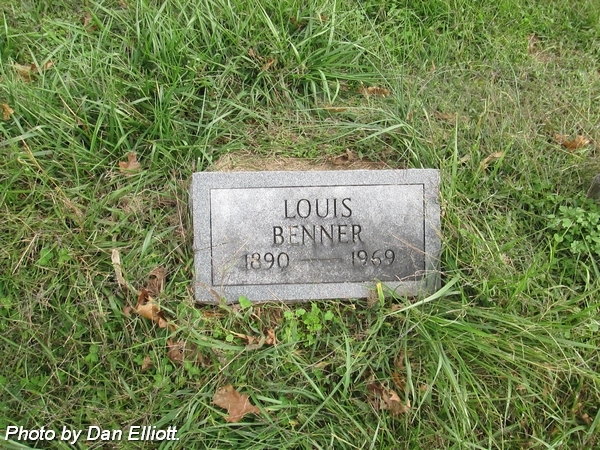 Son of Louis & Patsy (Lewis) Benner. nee Lewis. 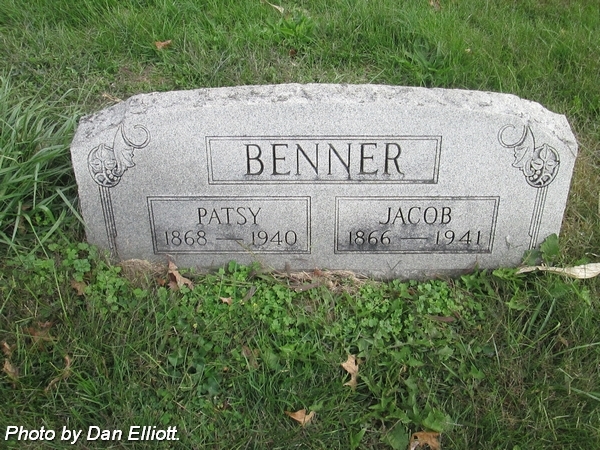 Wife of Jacob Benner. Married 23 May 1898. 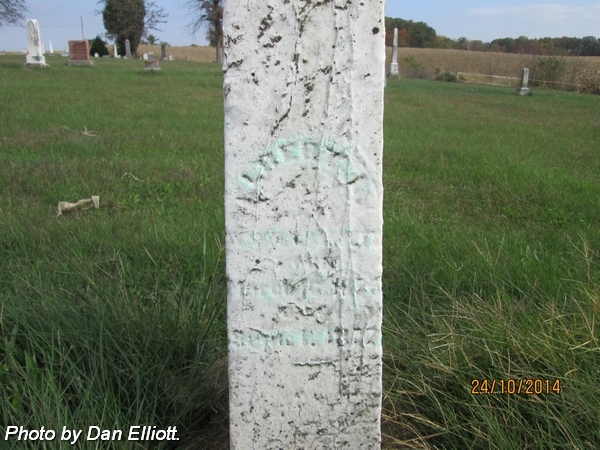 Daughter of Thompson Price & Elizabeth Jane (Green) Lewis. nee Phillips. 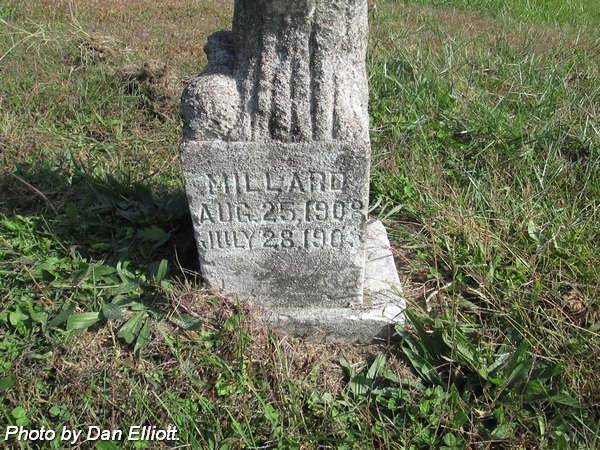 Wife of McKee, 1st; and first wife of William B Birdwell, 2nd. 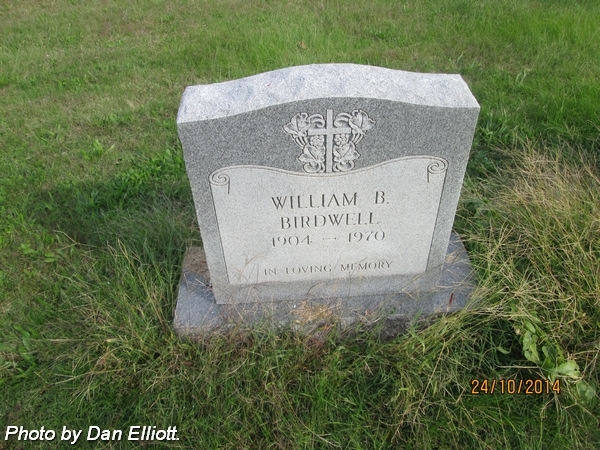 Second husband of Olee V “Ola” (Phillips) McKee Birdwell, 1st; and Arminta Birdwell, 2nd. nee Barton. 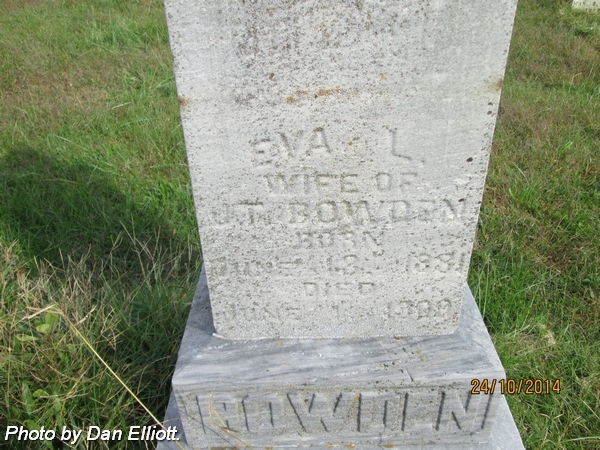 Wife of James T Bowden. Married 23 Dec 1900. 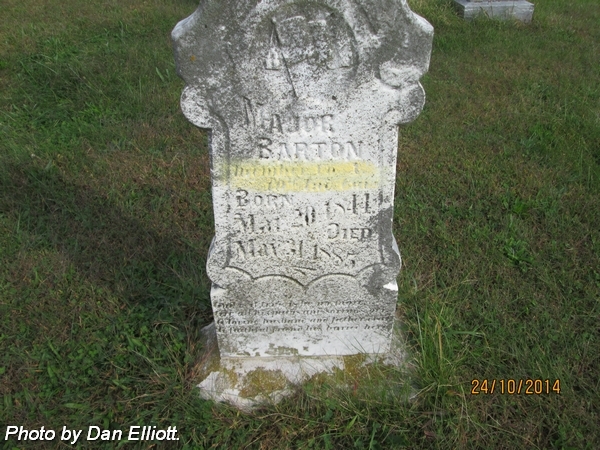 Daughter of Major B & Harriet Jane (McKee) Barton. nee Barton. Wife of Clay Bradley. 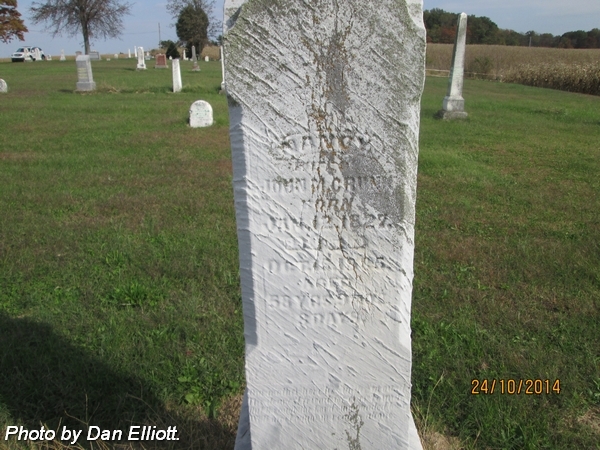 Daughter of Clay & Elizabeth J (Barton) Bradley. Son of ? & M J. Bradley. In the 40 year of her age. 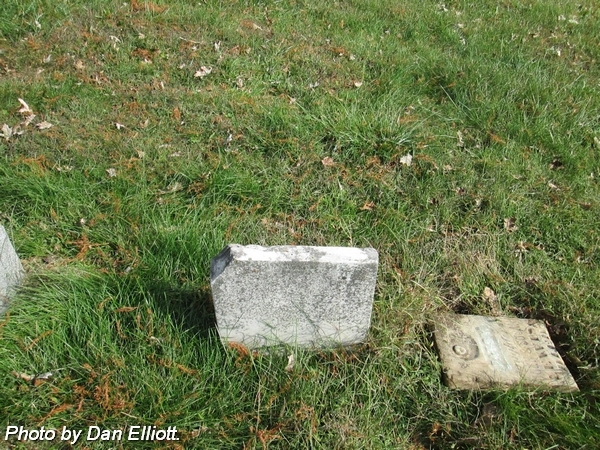 Note: Nearest stone is for William R Clark. Broken and missing stone near William R Clark. 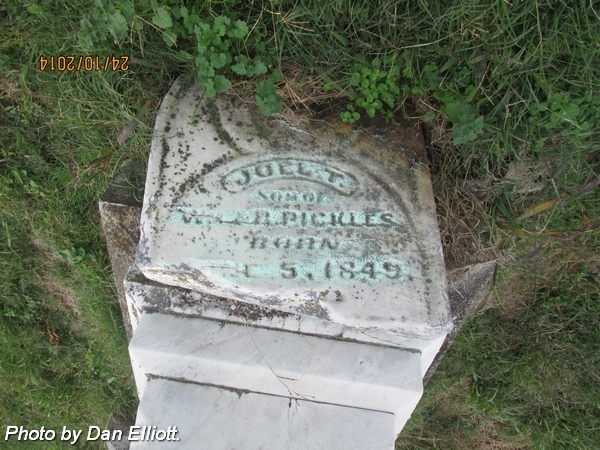 Son of Augustine Elisha “Agustin” & Lydia A “Y” (Crabtree) Clark. nee Mosby. 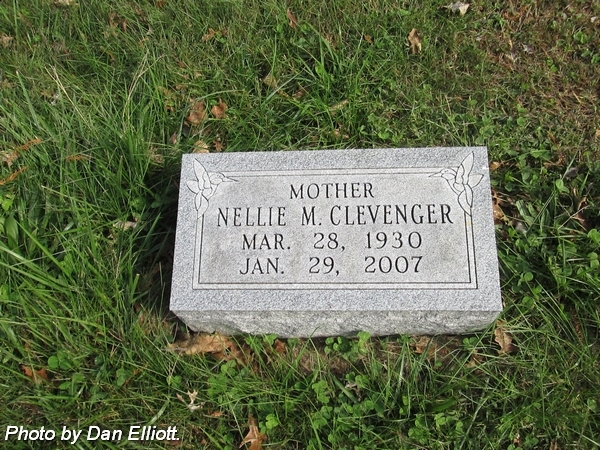 Wife of James Clevenger. 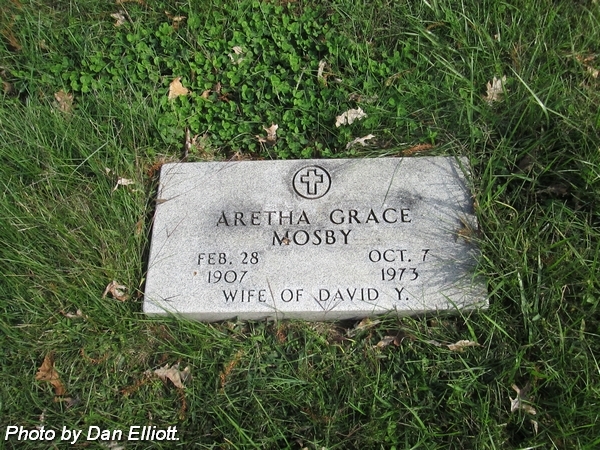 Daughter of David & Aretha Grace Mosbey. 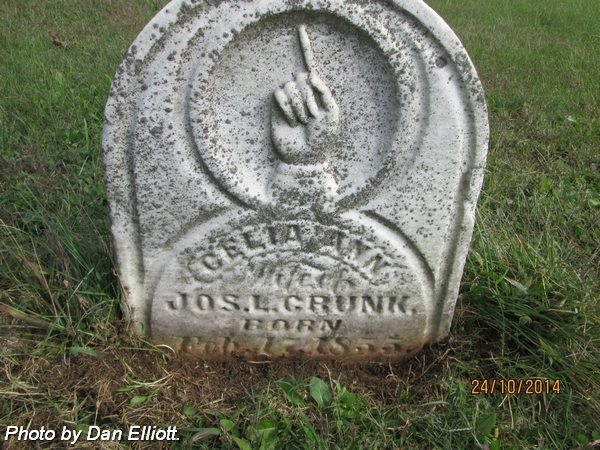 Son of Joseph L & Barbara (Trempe) Crunk. nee Barton. Wife of Abner Crunk. Married 15 Mar 1843. 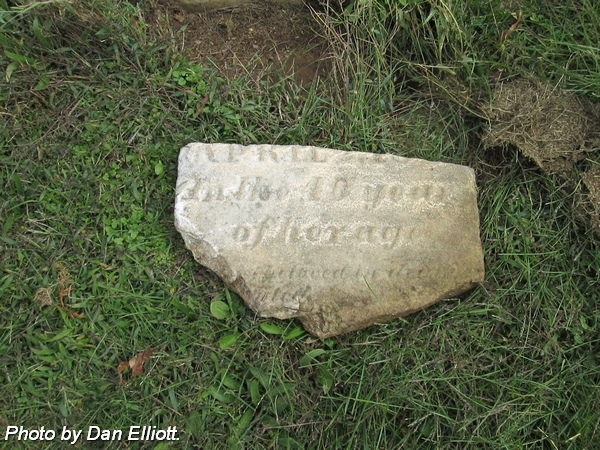 Note: Stone is badly worn. nee Dixon. First wife of Joseph L Crunk. 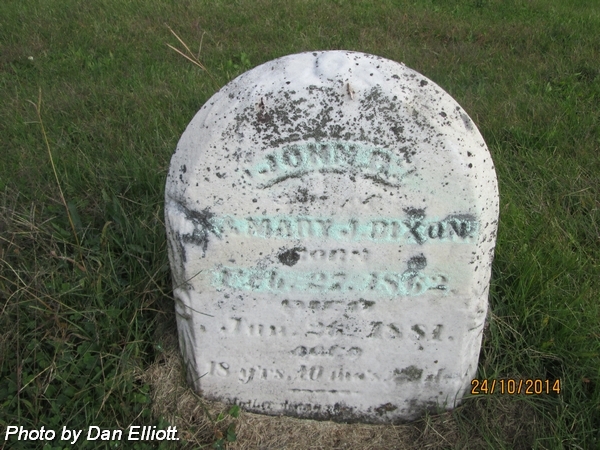 Daughter of Johnson & Mary Dixon. 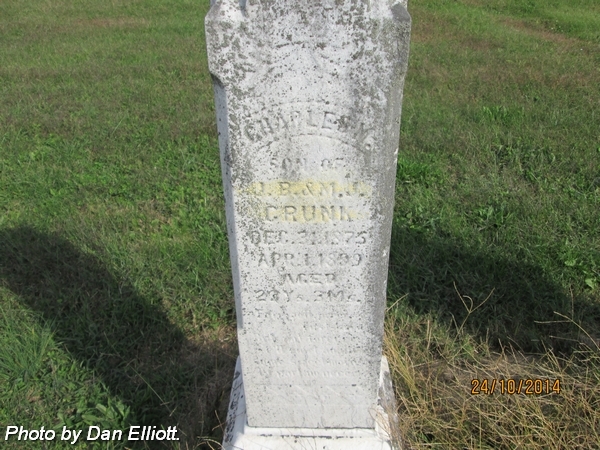 Husband of Elzina (Dixon) Crunk. Son of Mathew & Permelia (Moore) Crunk. Son of John B & Matilda J (Weare) Crunk. Aged: 23 Ys. 3 Ms. 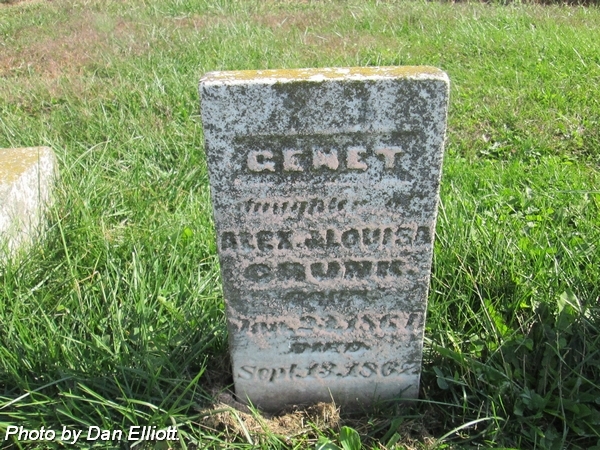 Daughter of Alexander “Alex” & Louisa (Dixon) Crunk. 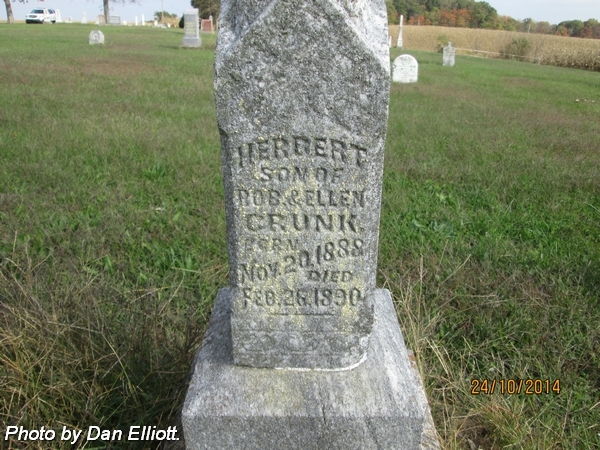 Son of Charles & Elzina (Dixon) Crunk. Son of Robert J & Ellen (Derrington) Crunk. 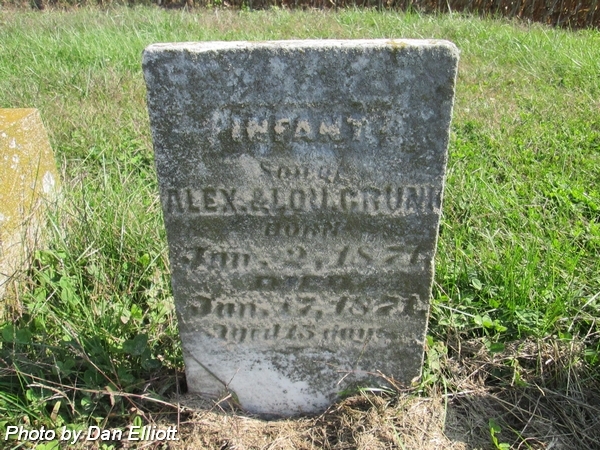 Infant son of Alexander “Alex” & Louisa (Dixon) Crunk. 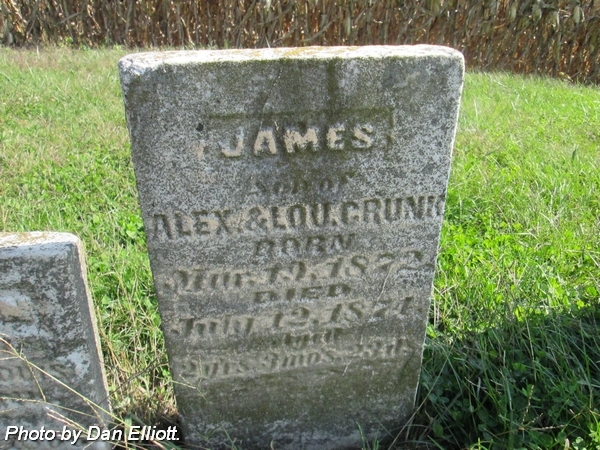 Son of Alexander “Alex” & Louisa (Dixon) Crunk. Aged: 2 yr’s. 3 m’s. 23 d’s. Son of Abner & Ann (Barton) Crunk. nee Lewis. 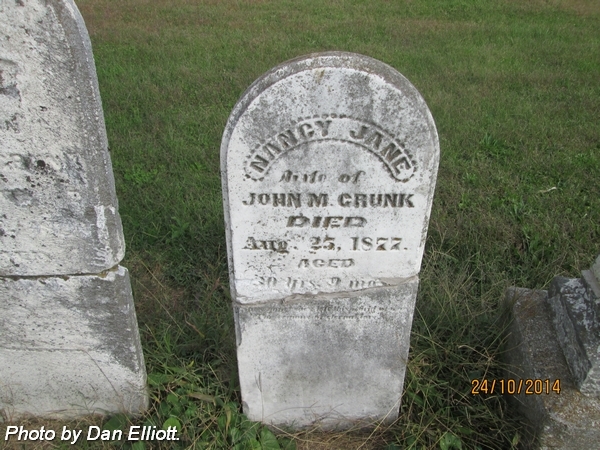 Wife of John Martin Crunk. 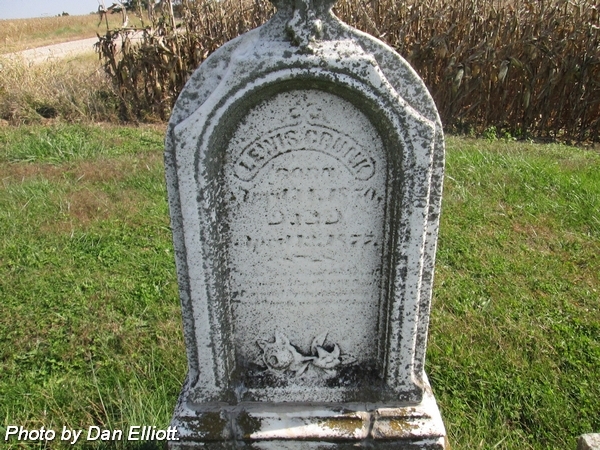 Married 7 Nov 1850. Aged: 58 Y’rs. 9 Mo’s. 8 Days. Wife of ? Little , 1st, and John M Crunk, 2nd, married 25 Mar 1872 in White County, Illinois. Aged: 30 Y’rs. 9 Mo’s & ? nee Knowles. 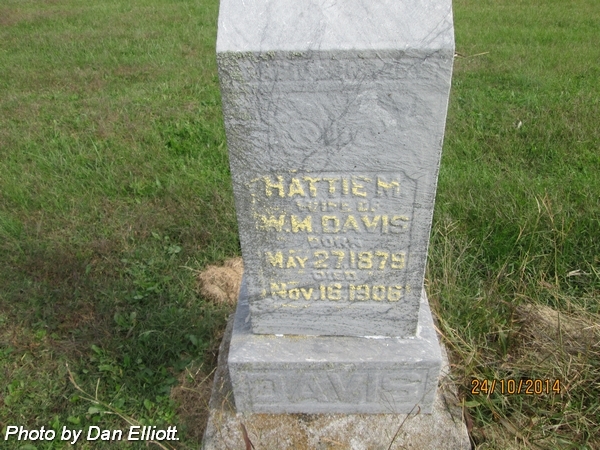 Wife of William M Davis. 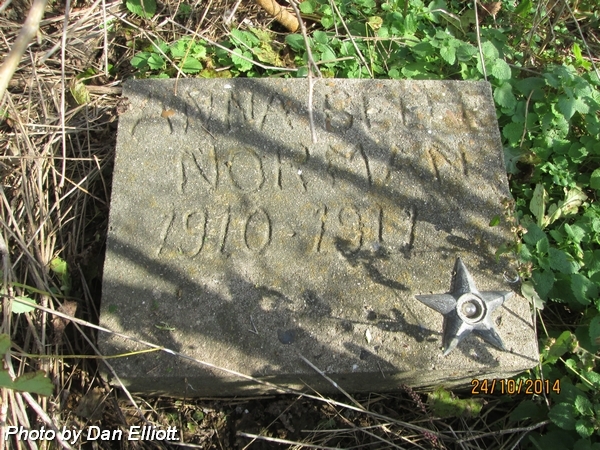 Married 12 Dec 1905. 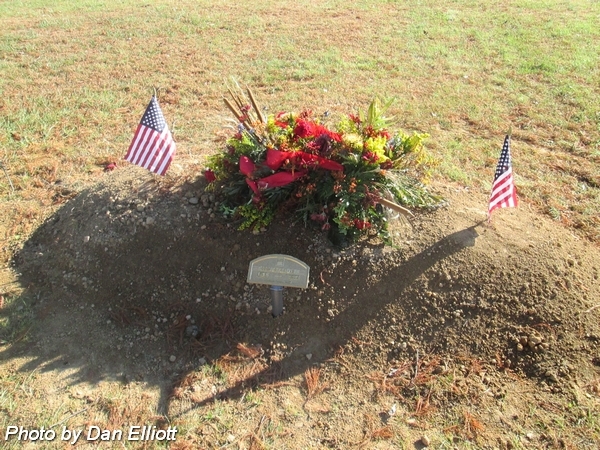 Husband of Hattie M (Knowles) Davis. Married 12 Dec 1905. 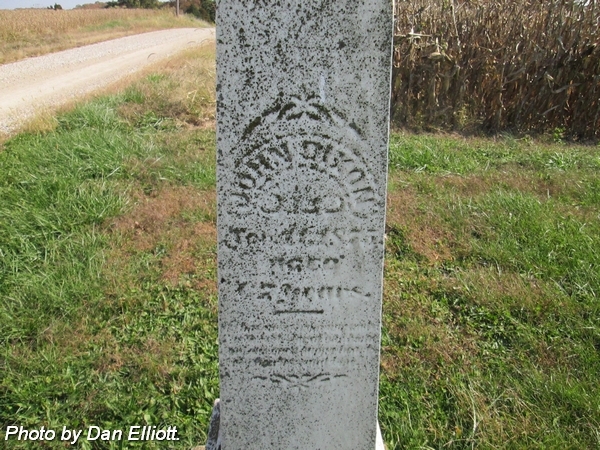 Son of John W & Martha A (Lewis) Derington. 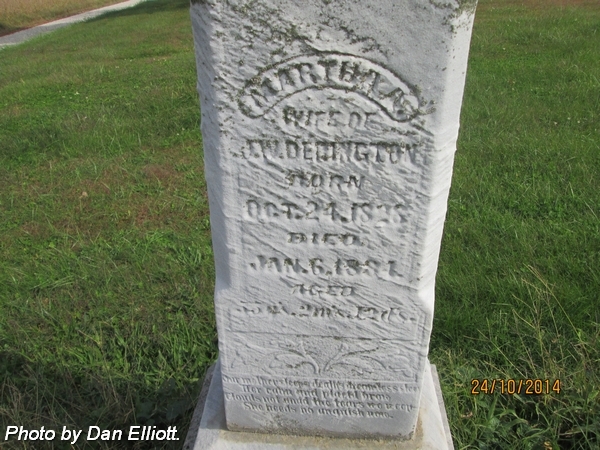 Husband of Martha A (Lewis) Derington. 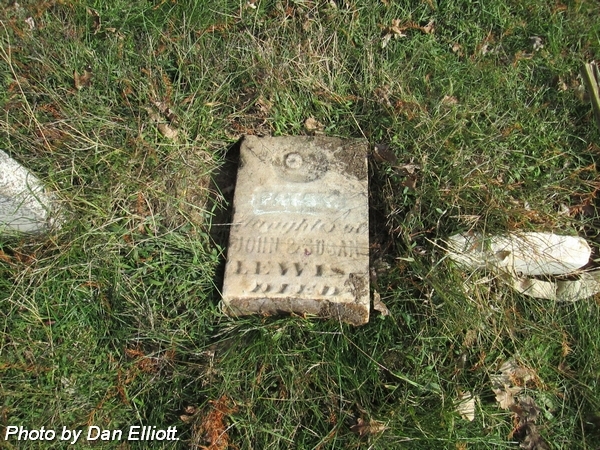 Married 22 Mar 1855.
nee Lewis. 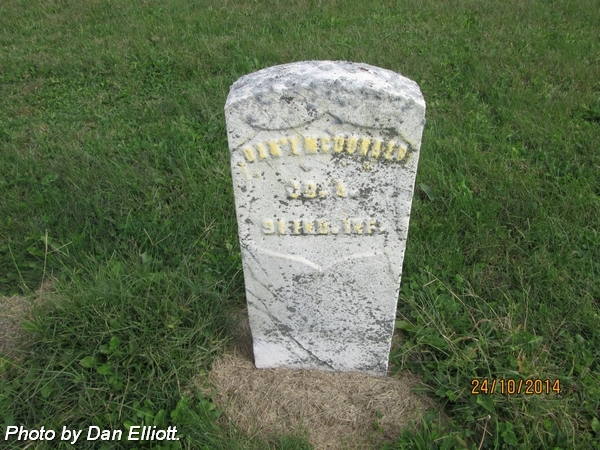 Wife of John W Derington. Married 22 Mar 1855. 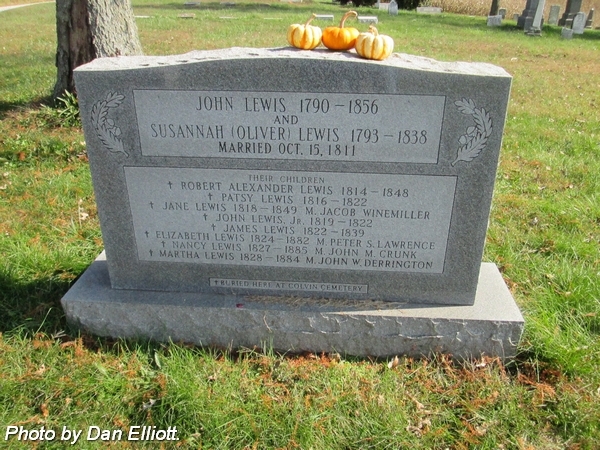 Daughter of John & Susannah “Susan” (Oliver) Lewis. Aged: 55 Y’s. 2 m’s. 12 ds. 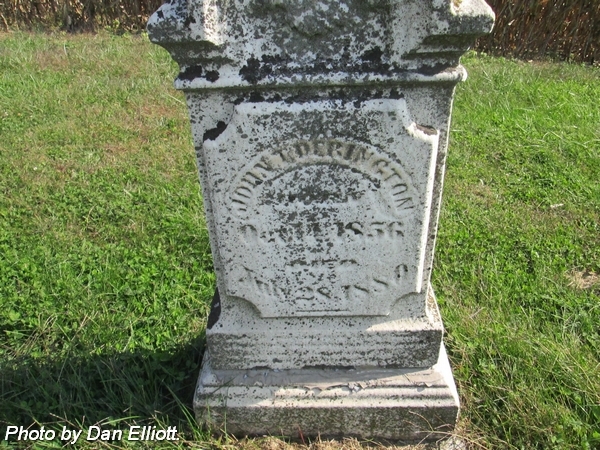 Daughter of John W & Martha A (Lewis) Derington. nee Downen. 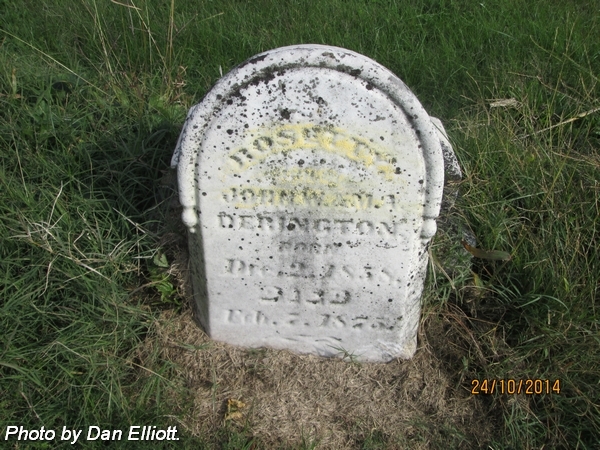 Wife of John Robert Dixon. Married 20 Jan 1831. 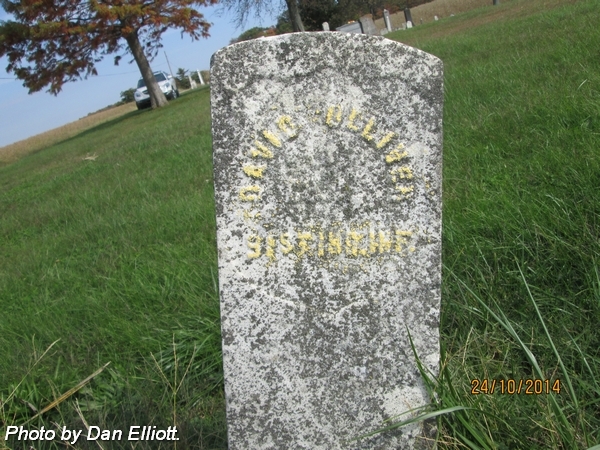 Daughter of David & Elizabeth (Oliver) Downen. Aged: 77 yr ? mos. ? das. Son of Johnson & Mary J Dixon. Aged: 18 y’rs. 10 mo’s. & ? ds. 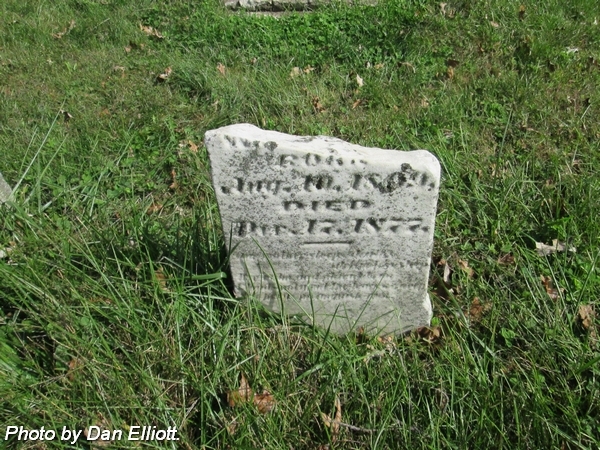 Husband of Jane (Downen) Dixon. 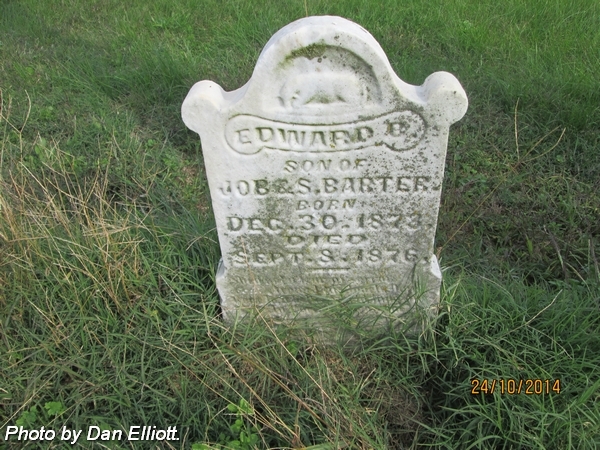 Married 20 Jan 1831.
nee Barter. 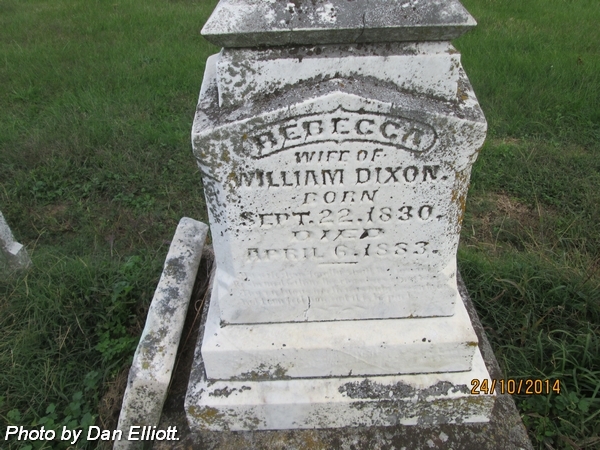 Wife of William Dixon. Married 23 Dec 1856. 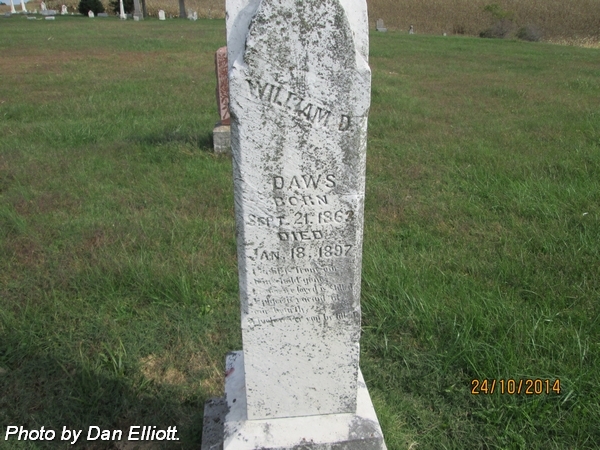 Daughter of William & Elizabeth (Downen) Barter. 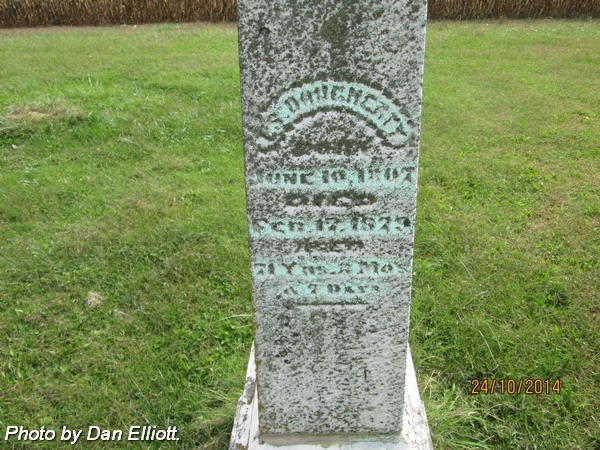 Son of Thomas S & Louisa V Dougherty. 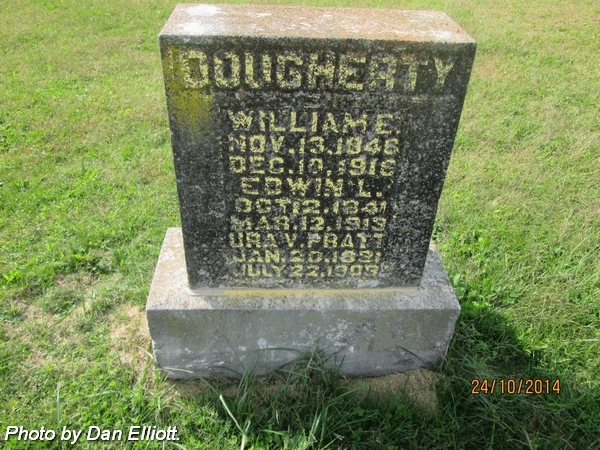 Wife of Thomas S Dougherty. Aged 70 Y’rs. 3 Mo’s. & 25 Days. 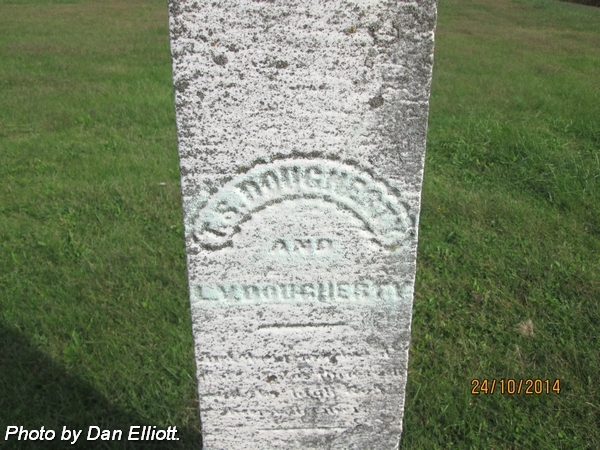 Husband of Louisa V Dougherty. Aged: 71 Y’rs. 2 Mo’s. & 7 Days. nee Barton. 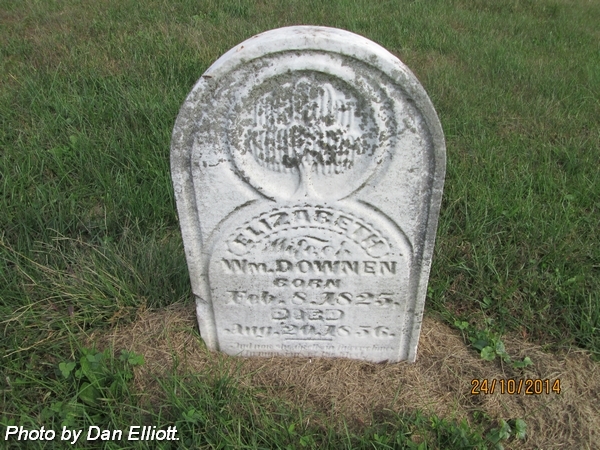 Wife of William Downen. 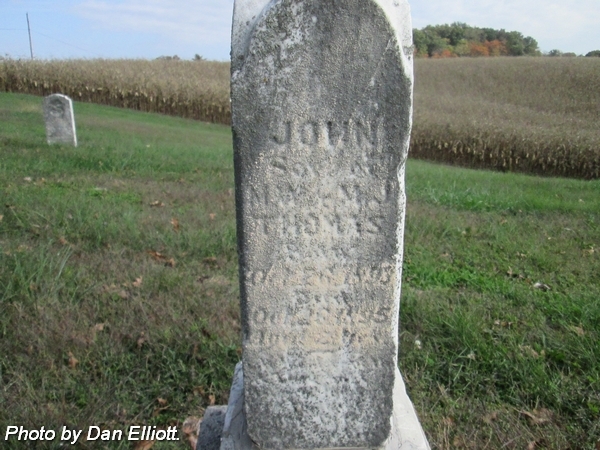 Married 2 Nov 1843. Daughter of William & Cynthia (Downen) Barton. 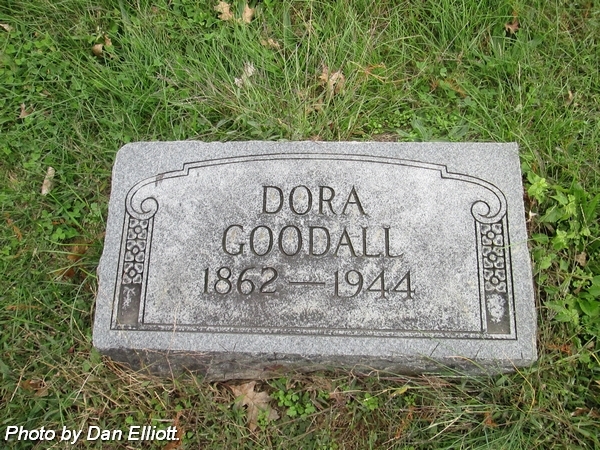 Husband of Eudora “Dora” (Lewsi) Goodall. Married 14 Jul 1887. Son of Rhas. & Susan (Sasseen) Goodall. nee Lewis. 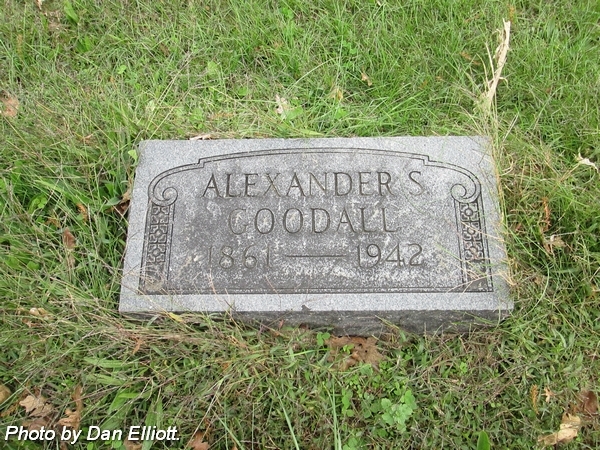 Wife of Alexander S “Alex” Goodall. Married 14 Jul 1887. 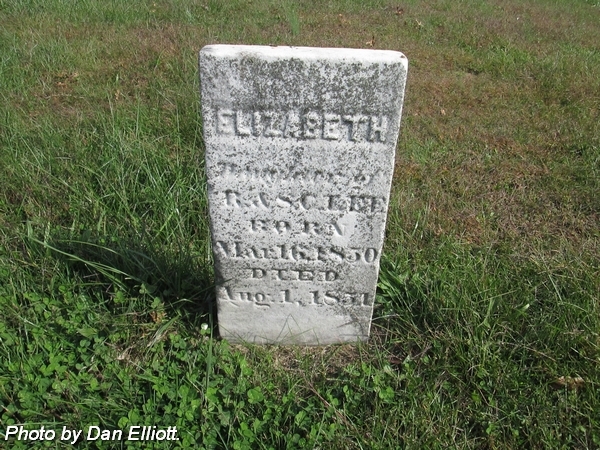 Daughter of Thompson & Elizabeth J (Green) Lewis. 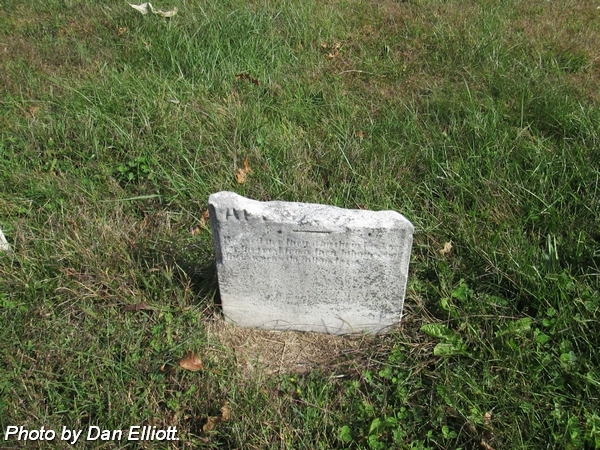 Wife of Thomas S Green. nee Lewis. 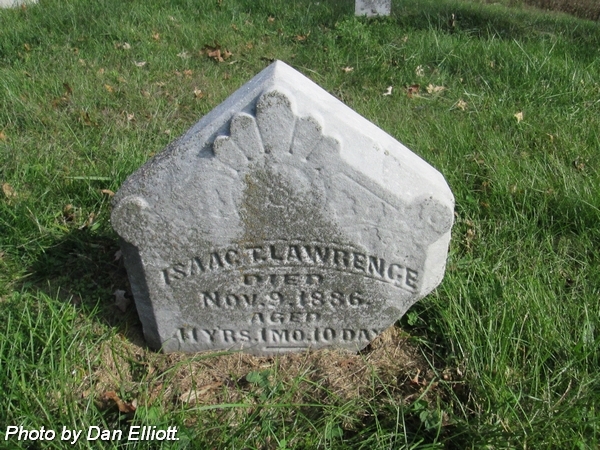 Wife of Isaac Lawrence, 1st married 29 Sep 1864; and Thomas M Green, 2nd married 3 May 1891. Daughter of Robert & Martha “Marthy” (Martin) Lewis. 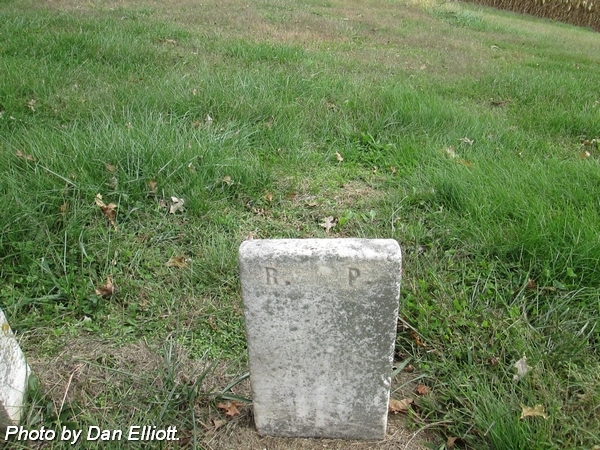 Son of William E & Orilla J (McPherson) Hamel. nee McPherson. 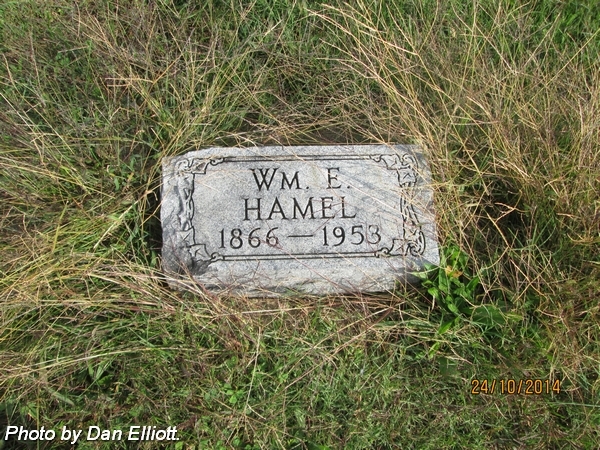 Wife of William E Hamel. Married 28 Feb 1889 or 1890. 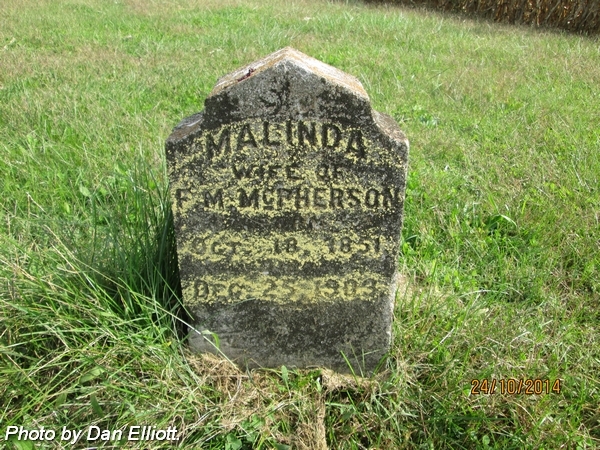 Daughter of Franklin & Malinda (Souls) McPherson. 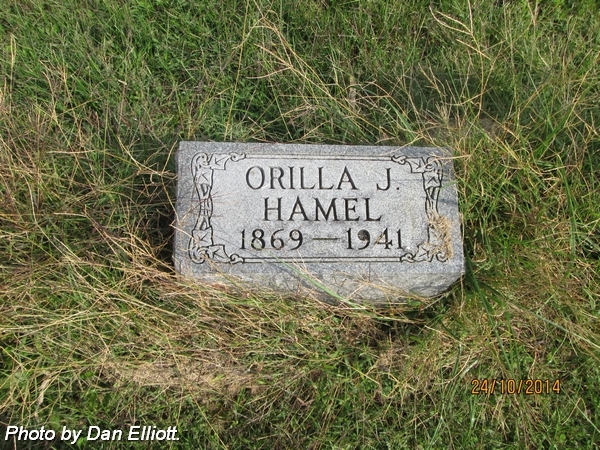 Husband of Orvilla J (McPherson) Hamel. Married 28 Feb 1889 or 1890. 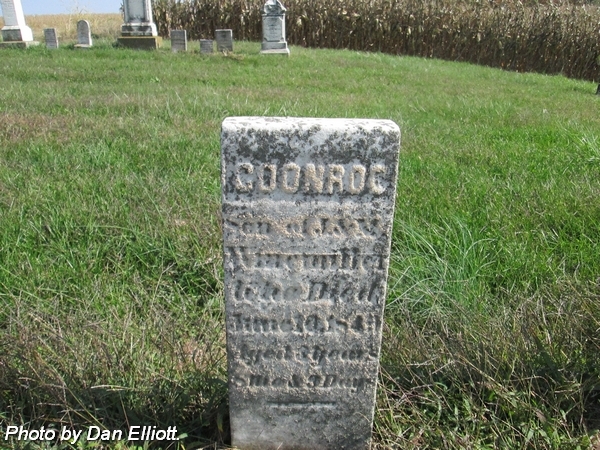 Son of John & Mary (Koon) Hamel. nee Carmony. 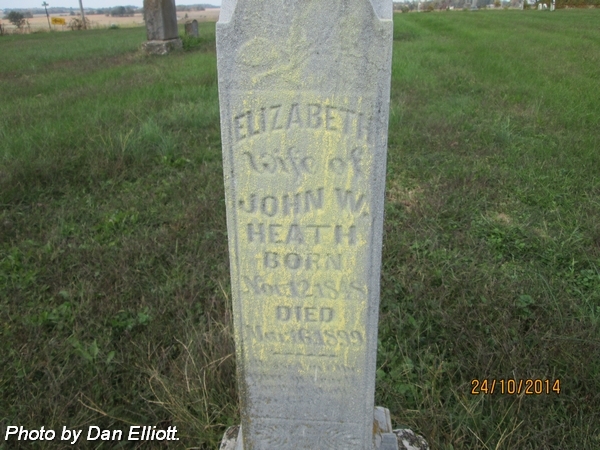 Wife of John W Heath. Daughter of William & Mary (Williams) Carmony. Wife of Dr. A S Holland. 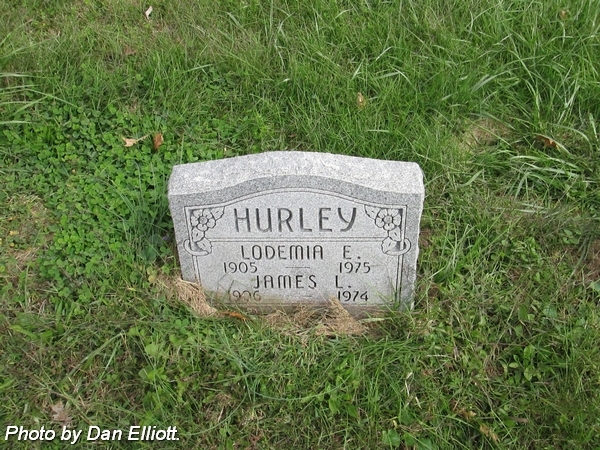 Husband of Lodema E (Lewis) Hurley. nee Lewis. 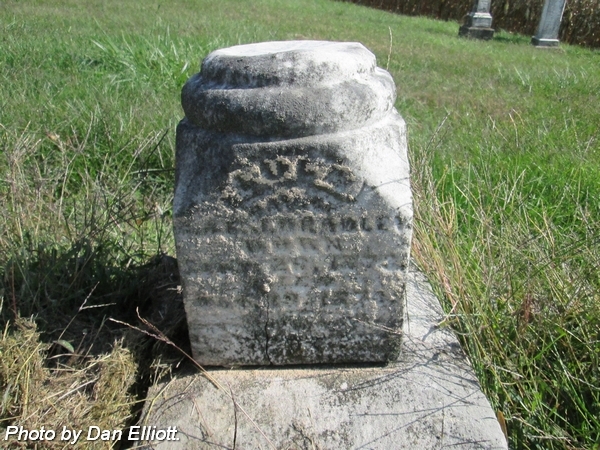 Wife of James L Hurley. 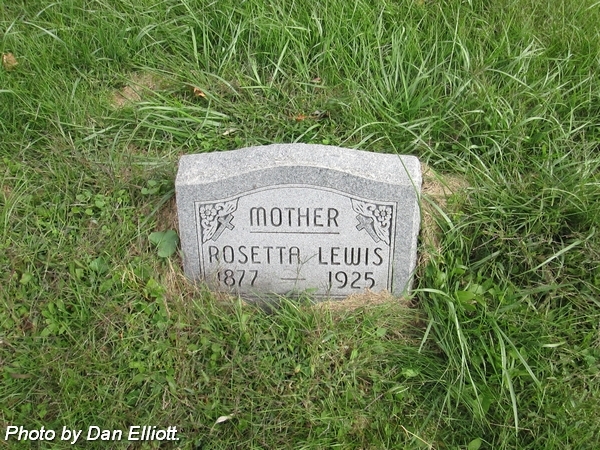 Daughter of Ellsworth & Rosetta “Rosa” Lewis. nee Lawson. 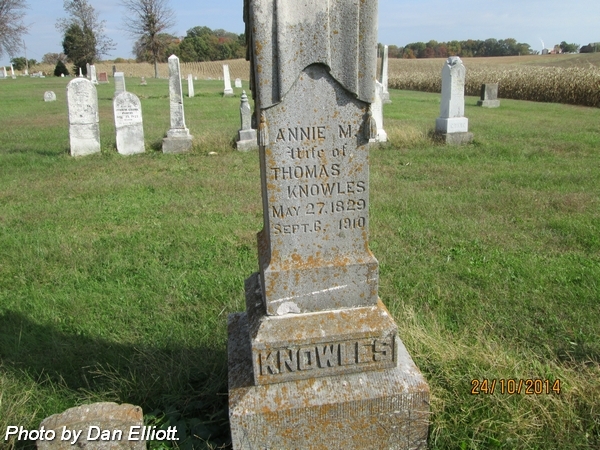 Wife of Thomas Knowles. Married 2 May 1846. Son of Thomas & Anna Maria (Lawson) Knowles. Son of D & L Knowles. Husband of Anna Maria (Lawson) Knowles. Married 2 May 1846. 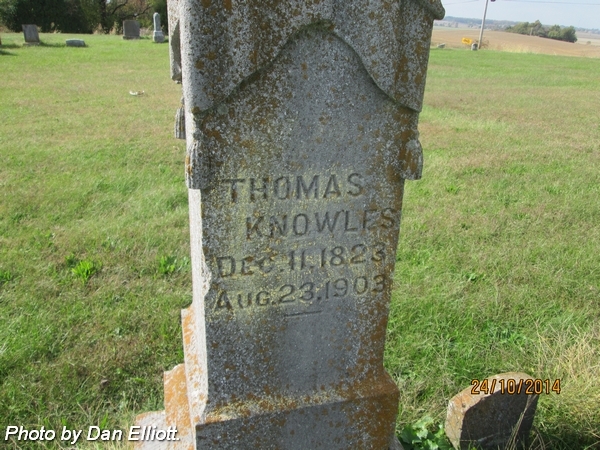 Son of Thomas & Anna Marie (Lawson) Knowles. Aged: 29 Y’rs. 9 Mo’s. 10 D’ys. 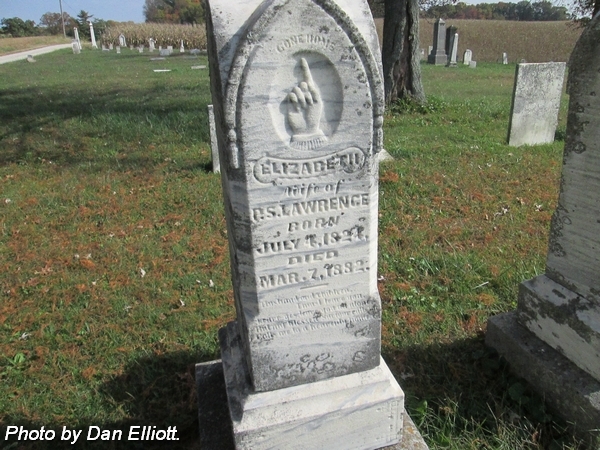 Husband of Carrie M (Benjamin) Lawrence. Married 12 Jan 1902. 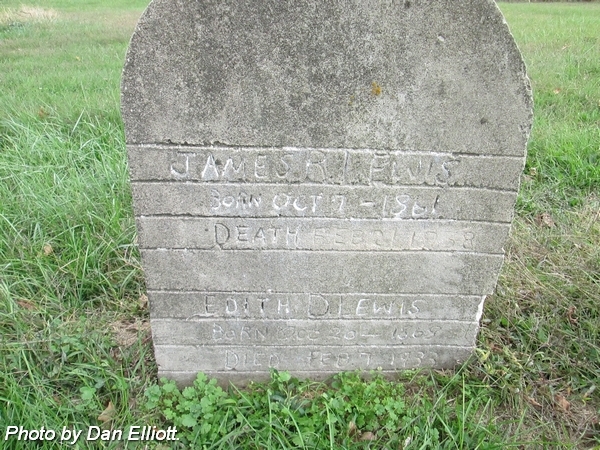 Son of Isaac Lawrence & Orilla J (Lewis) Lawrence Green. 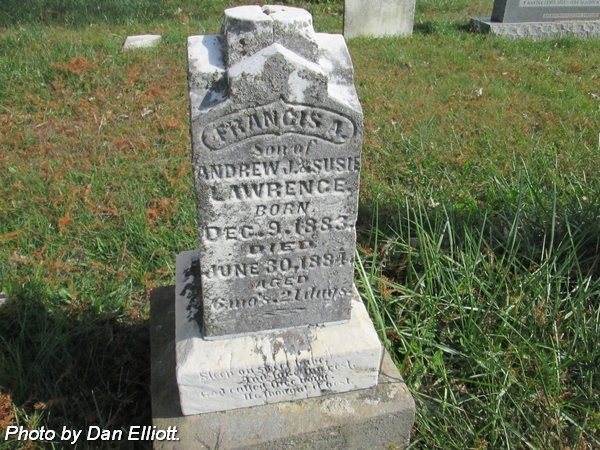 Husband of Susie N (Caldwell) Lawrence. Married 8 Mar 1883. 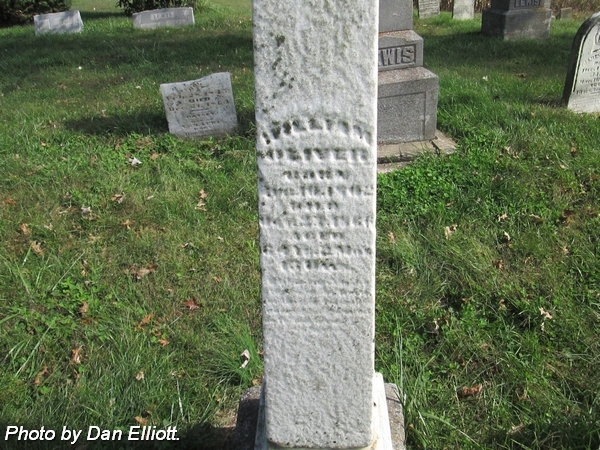 Son of Peter S & Elizabeth Lawrence. 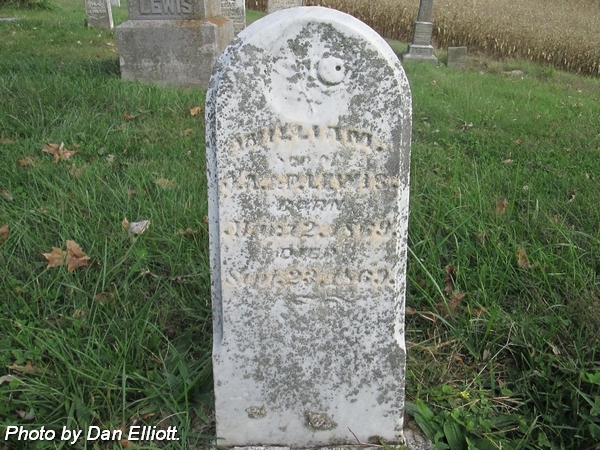 Son of Andrew J & Carrie M (Benjamin) Lawrence. 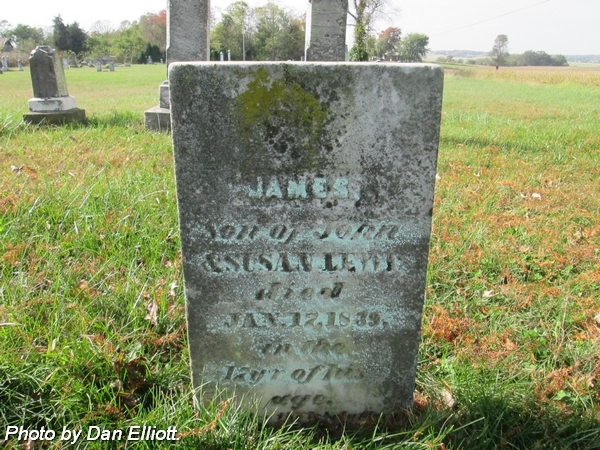 Son of Isaac & Orilla J “Oilla” (Lewis) Lawrence. nee Lewis. 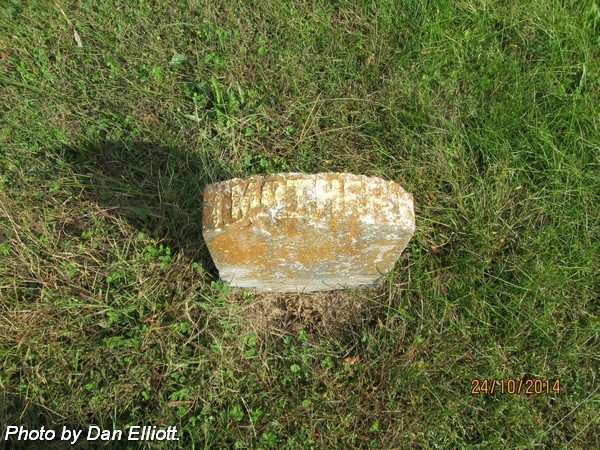 Wife of Robert Bradley, 1st, married 19 Mar 1855; and second wife of Peter S Lawrence, married 3 May 1858.
nee Read. 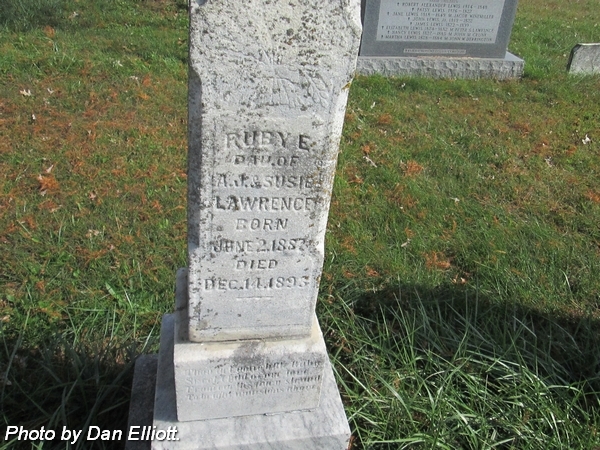 Wife of Robert S Lawrence. Married 25 May 1890. Daughter of John & Jane (Johnson) Read. Son of Andrew J & Susie N Lawrence. Aged: 6 mo’s. 21 days. 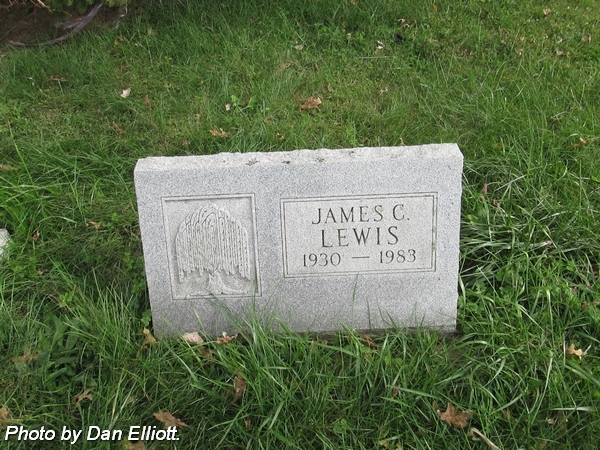 Husband of Orilla J “Oilla” (Lewis) Lawrence. Married 29 Sep 1864. Son of Peter S & Rachel (Thomas) Lawrence. Aged: 41 Y’rs. 1 mo. 10 Days. Husband of Rachel (Thomas) Lawrence, 1st, married 23 May 1844; Elizabeth (Lewis) Bradley Lawrence, 2nd married 3 May 1858; and Mary Ethel (Duckworth) Lawrence, 3rd married 18 Dec 1884. 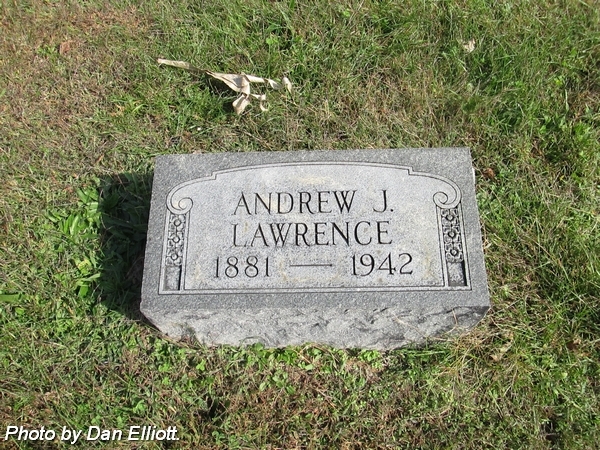 Daughter of Andrew J & Susie N (Caldwell) Lawrence. nee Caldwell. 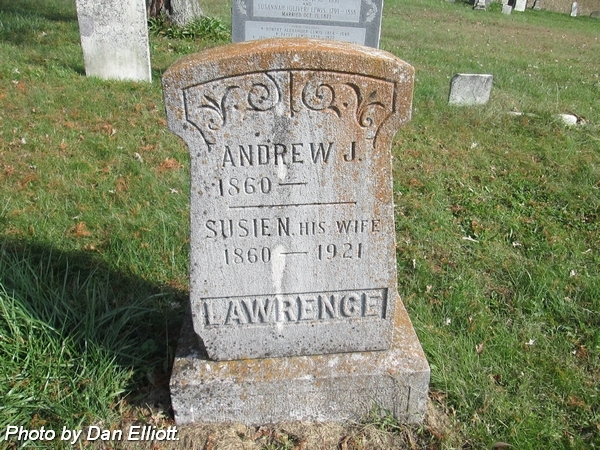 Wife of Andrew J Lawrence. Married 8 Mar 1883. Daughter of Francis & Ruth D (Marrs) Caldwell. 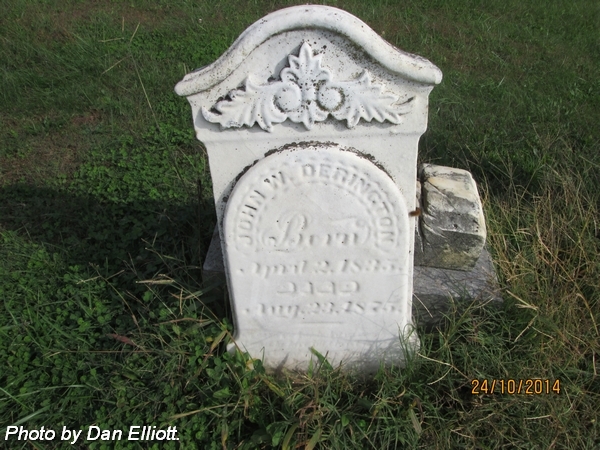 Daughter of Samuel C & Ruth “Rutha” (Barton) Lee. 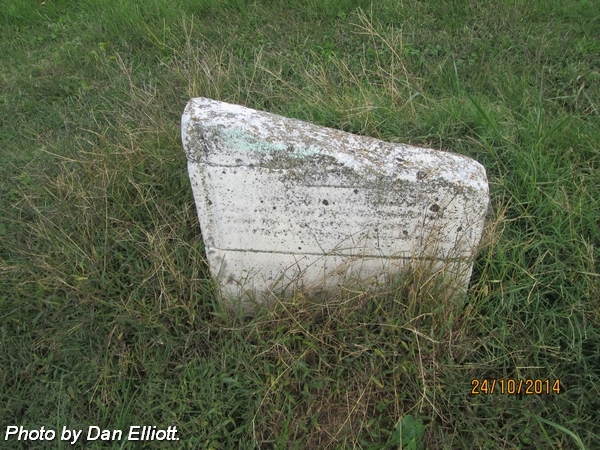 Daughter of Samuel C & Ruth “Rutha” (Barton) Lee.Aged: 2 Y’s. 8 Mo’s. 25 days. 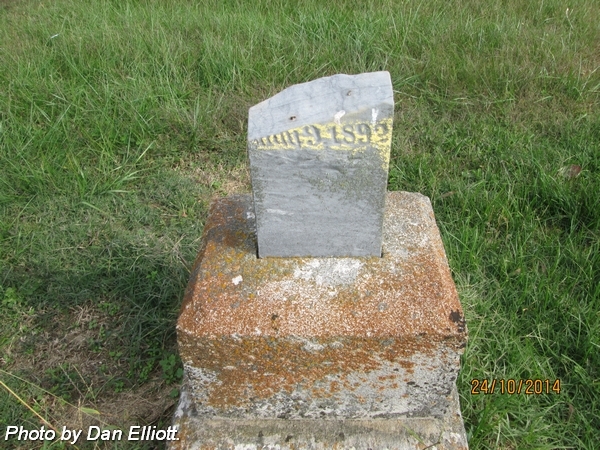 Son of Samuel C & Ruth “Rutha” (Barton) Lee.Note: Top of stone is missing. 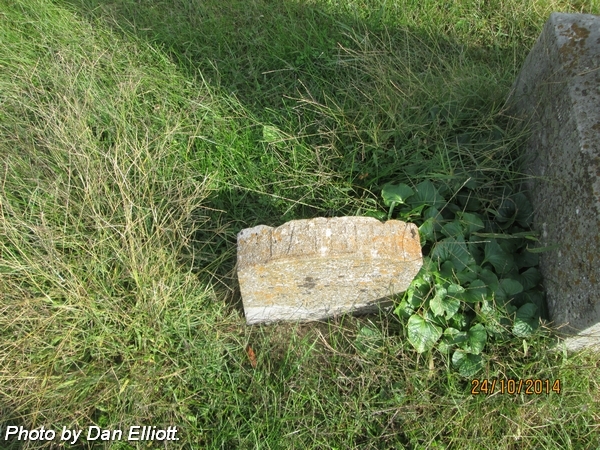 Note: Top of stone missing. Daughter of N & M Lewis. 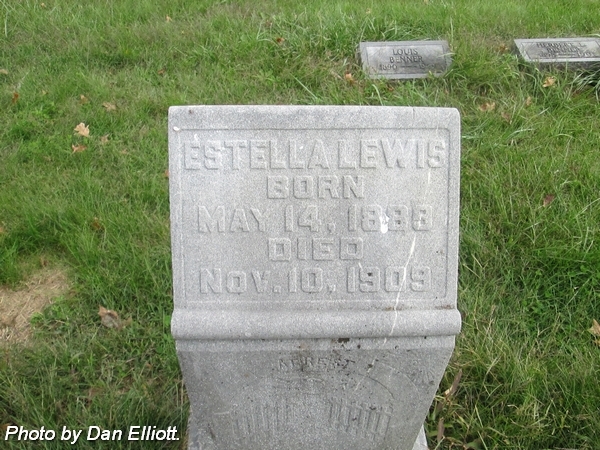 Daughter of Ellsworth & Rosetta “Rosa” (Harrison) Lewis. Daughter of R & L Lewis. nee Maxey. 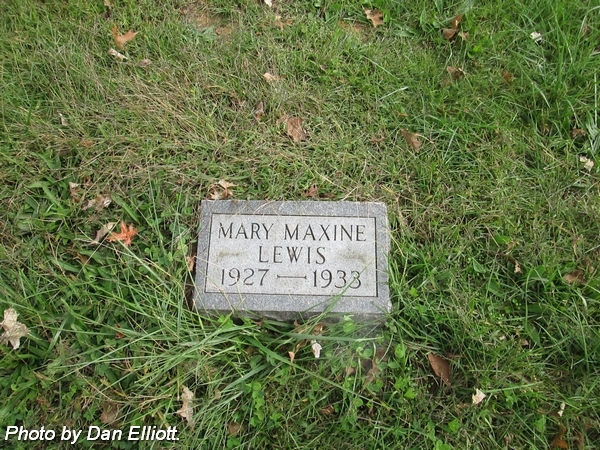 Wife of Hartley J Lewis. 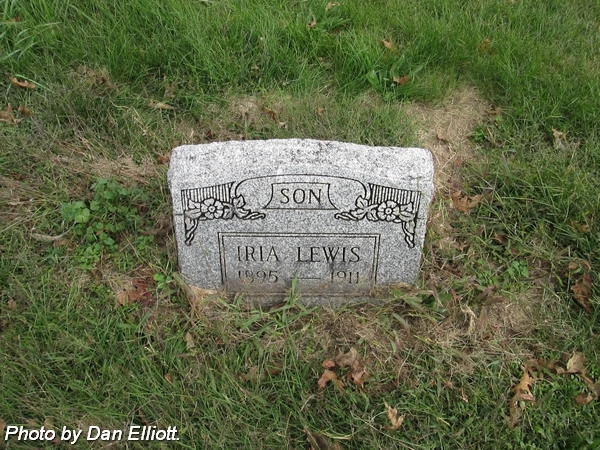 Son of Ellsworth & Rosetta “Rosa” (Harrison) Lewis. Pfc., US Army, WW II. 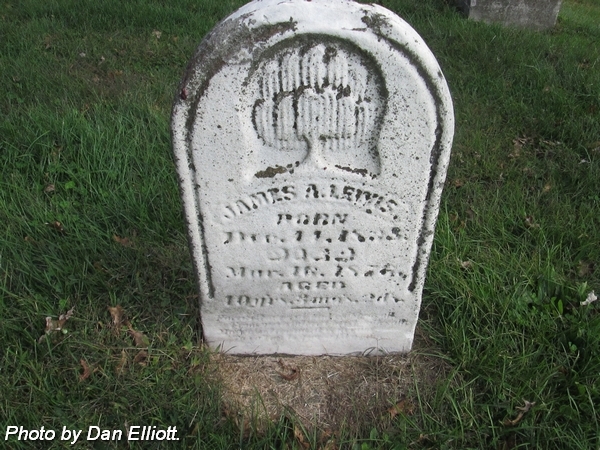 Second wife of James R Lewis. 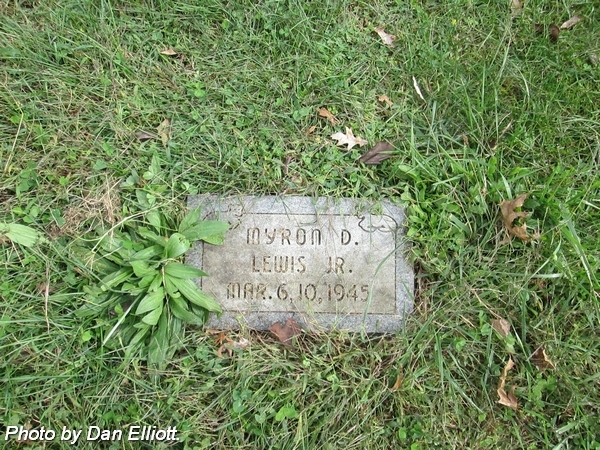 Husband of Mary L (Carroll) Lewis. 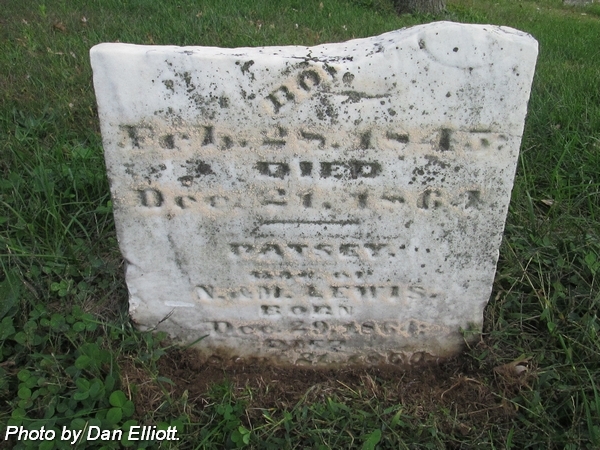 Son of Price & Viola (Hartley) Lewis. nee Green. Wife of Thompson P Lewis. 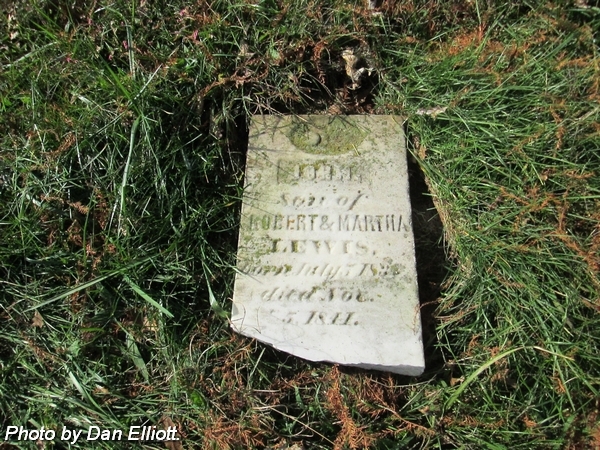 Husband of Rosetta “Rosa” (Harrison) Lewis. Married 18 Aug 1901. Son of Thompson P & Elizabeth (Green) Lewis. 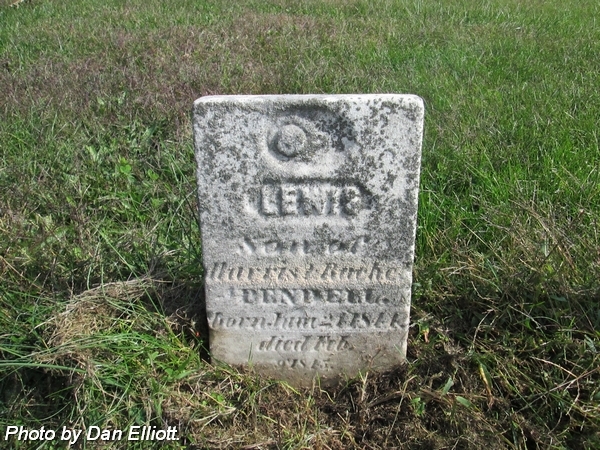 Daughter of Nathaniel & Lena (Benner) Lewis. 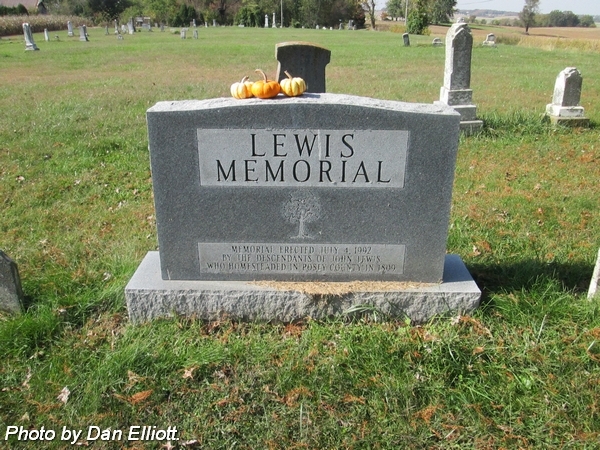 Husband of Sharon (Hirsch) Lewis. 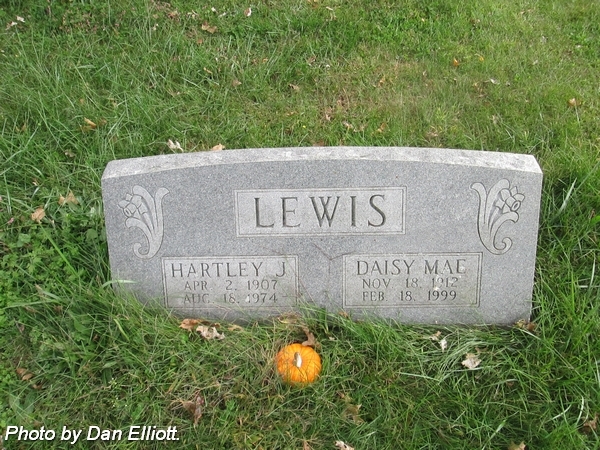 Son of Hartley & Daisy (Maxey) Lewis. 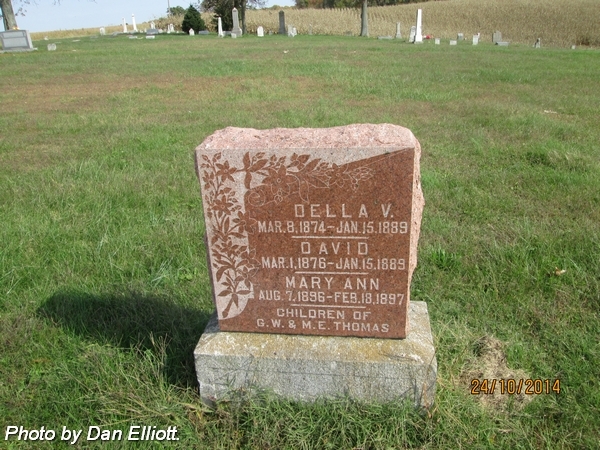 Husband of Daisy Mae Lewis. 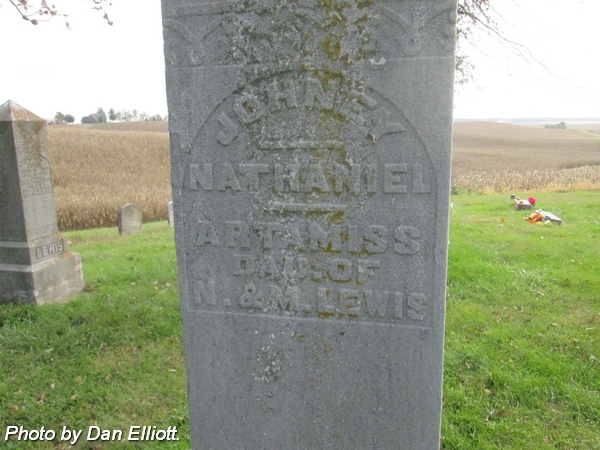 Son of Nathaniel & Lena (Benner) Lewis. 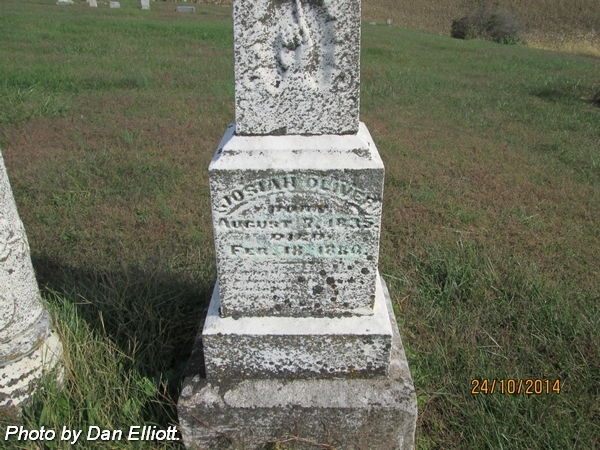 Son of John & Susannah “Susan” (Oliver) Lewis. 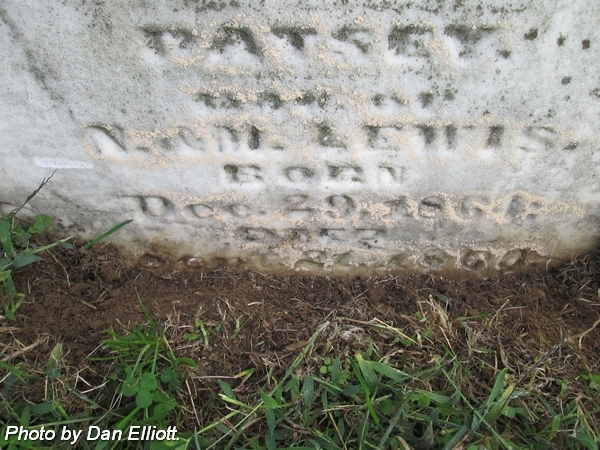 Husband of Martha “Patsey” (Dixon) Lewis. Married 10 Jan 1856. Son of Robert Alexander & Martha (Martin) Lewis. Aged: 40 y’rs. 3 mo’s. & 2 da. 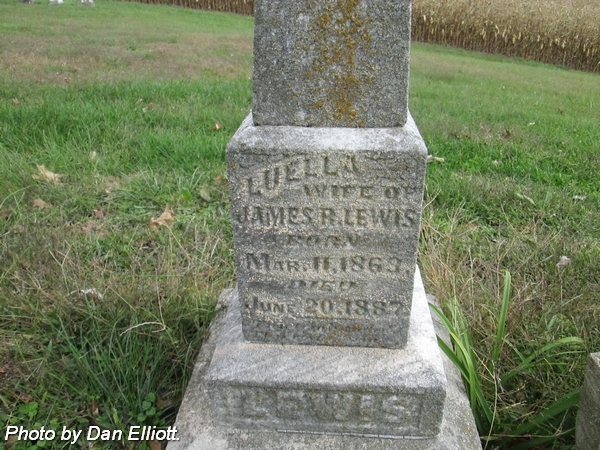 Husband of Luella (Wade) Lewis, 1st, married 20 Dec 1883; Donie Lewis, 2nd; and Edith E Lewis, 3nd. Daughter of James R & Luella (Wade) Lewis. 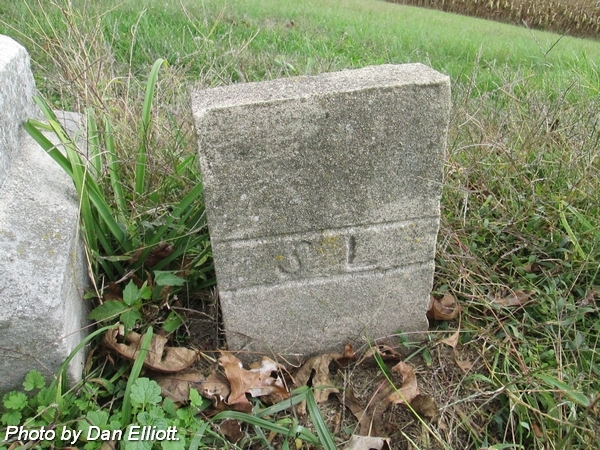 Husband of Susannah “Susan” (Oliver) Lewis. Married 15 Oct 1811. Son of N & M Lewis. Son of Myron D “Butch” & Margaret C “Peggy” Lewis, Sr.
nee Wade. First wife of James R Lewis. Married 20 Dec 1883. 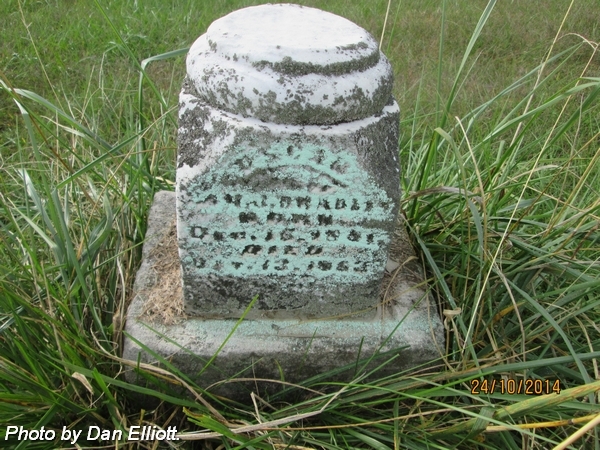 Daughter of Thomas S & Martha M Wade. nee Carroll. 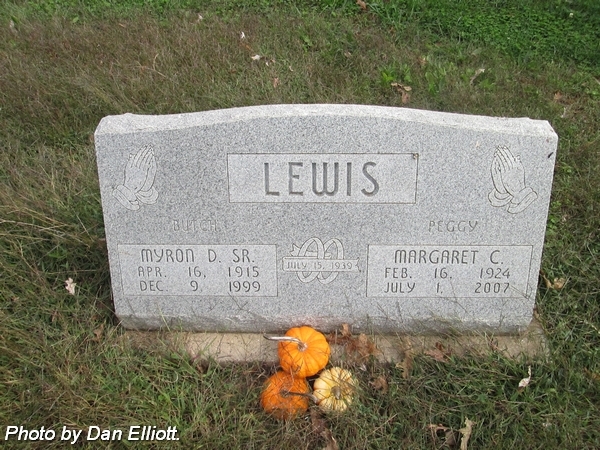 Wife of Myron D “Butch: Lewis, Sr. Married 15 Jul 1939. Daughter of John & Louise (Keitel) Carroll. nee Martin. 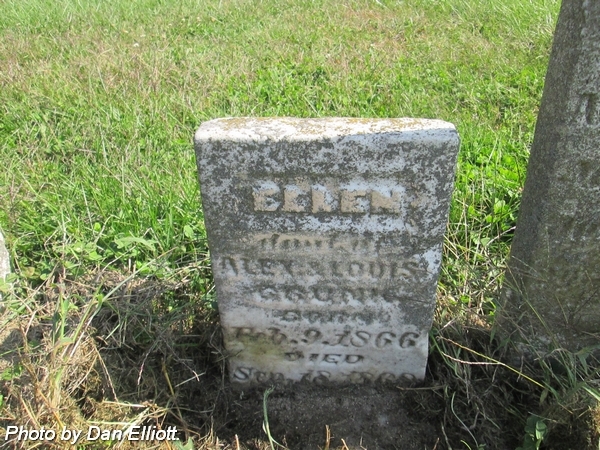 Wife of Robert Alexander Lewis. Married 30 Mar 1835.
nee Carroll. 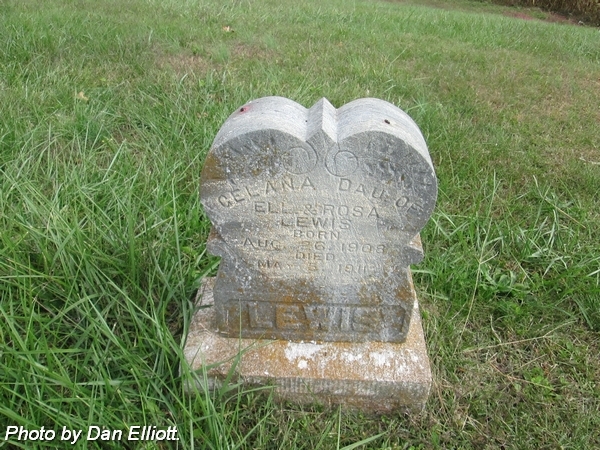 Wife of Edwin M Lewis. 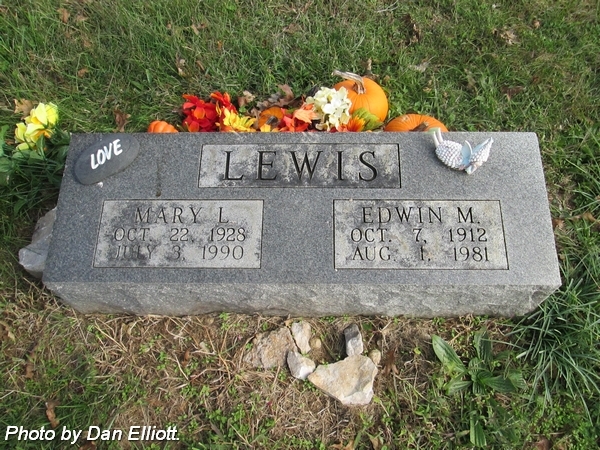 Husband of Margaret C “Peggy” Lewis. Married 15 Jul 1939. 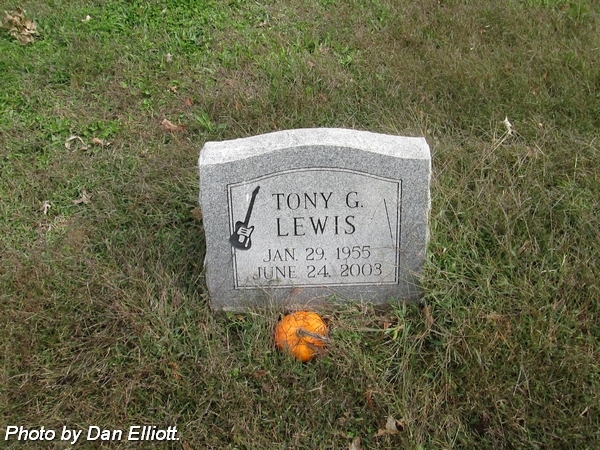 Son of Thompson P & Elizabeth J Lewis. 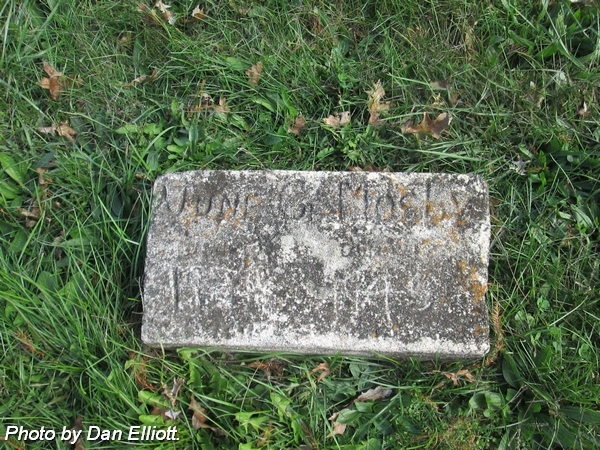 Husband of Viola E (Hartley) Lewis. 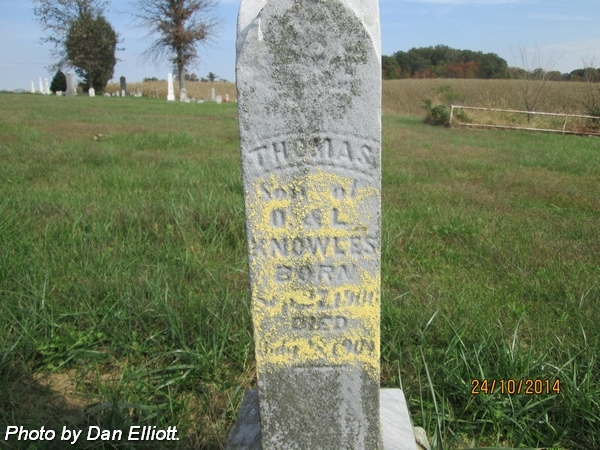 Son of Thompson P & Elizabeth J Lewis. 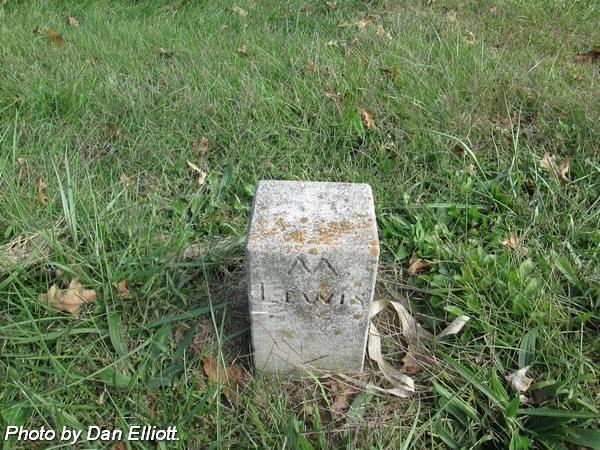 Son of James A & Martha (Dixon) Lewis. Husband of Martha “Marthey” (Martin) Lewis. Married 30 Mar 1835.
nee Harrison. 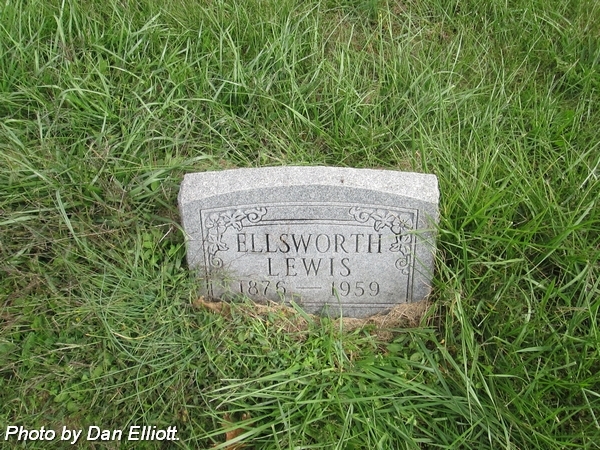 Wife of Ellsworth Lewis. Married 18 Aug 1901. Daughter of David & Galena (Knowles) Harrison. nee Oliver. Wife of John Lewis. Married 15 Oct 1811. 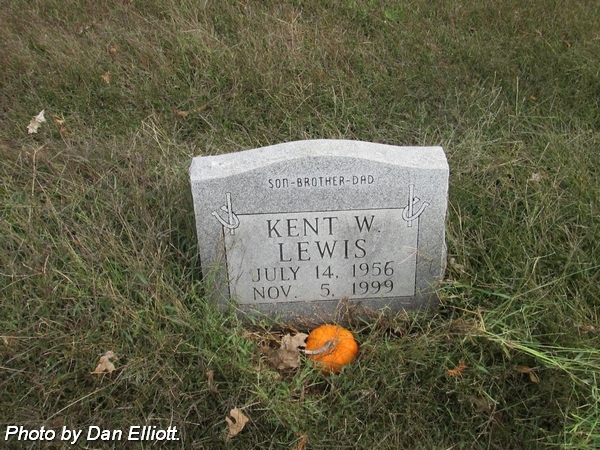 Husband of Elizabeth J Lewis. Son of Robert Alexander & Martha “Marthy” (Martin) Lewis. nee Hartley. 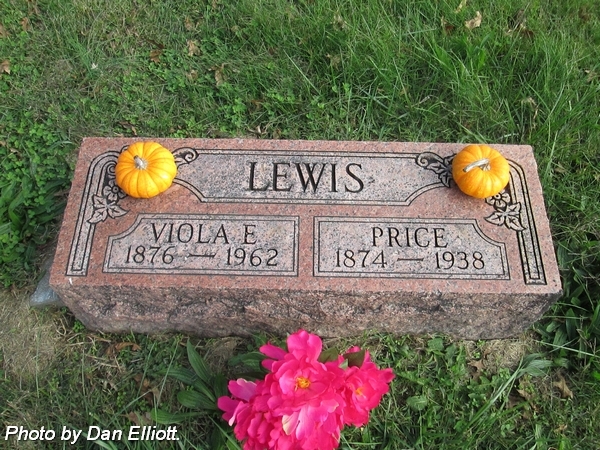 Wife of Price Lewis. 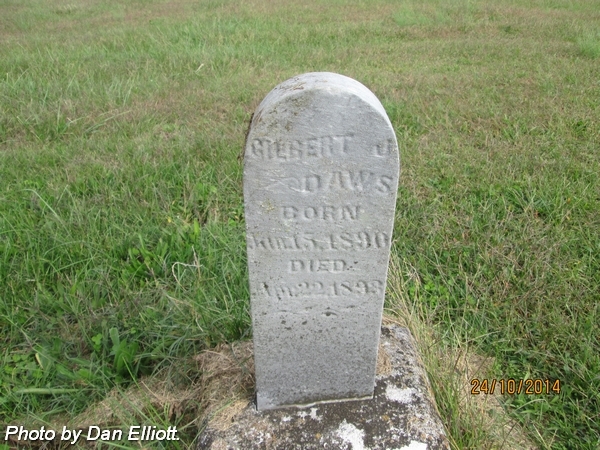 Son of James A & Martha Lewis. nee Crunk. Wife of John W Lilleston. Married 2 Jul 1885. Son of Michael Steven & Donna Charlene (Lewis) Lucero. nee Lewis. Wife of Michael Steven Lucero, Sr. Daughter of James C Lewis & Marilyn H Lewis Wiggington. 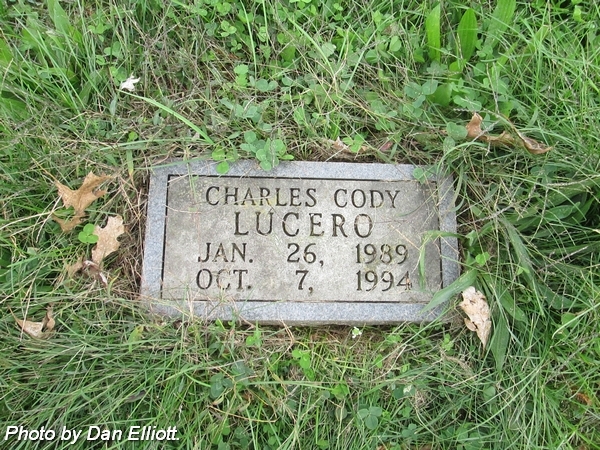 Husband of Donna Charlene (Lewis) Lucero. nee Crunk. Wife of John Lynch. Married 2 Oct 1873. Daughter of Timothy D & Mahala (Crunk) Lynch. Husband of Rebecca A (McIntosh) McDonald. Married 15 Apr 1860. 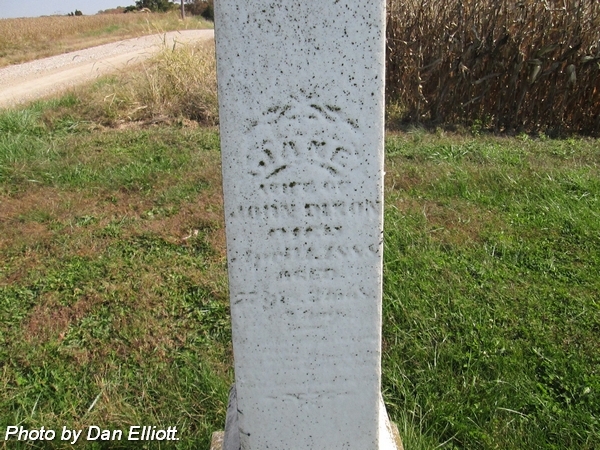 Pvt., Co A, 91st Indiana Infantry. Enlisted 10 Aug 1862. Discharged 26 Jun 1865. Son of McKee & Olee V “Ola” (Phillips) McKee Birdwell. Pvt., US Army, WW II. In the 86 yr of her age. 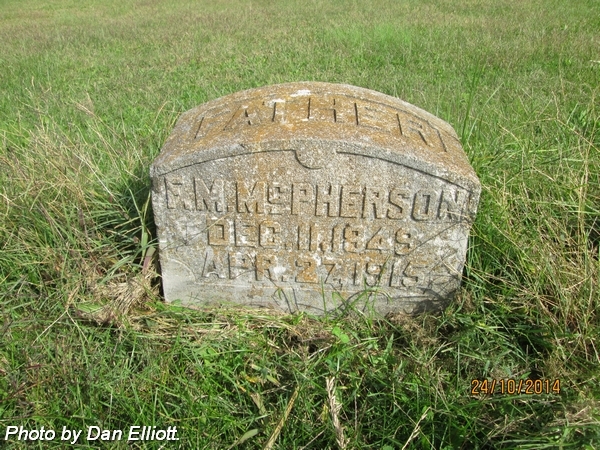 Wife of Francis M “Frank” McPherson. 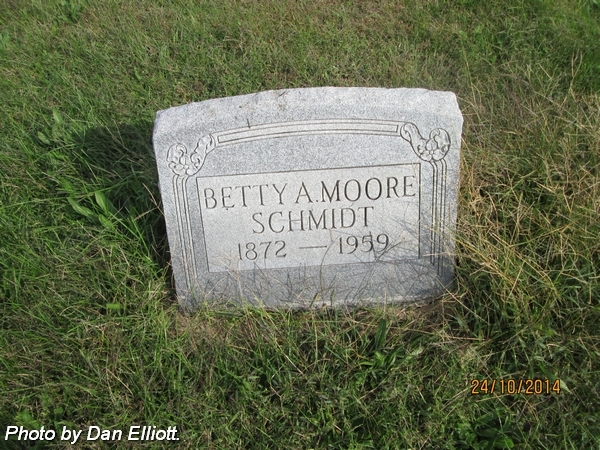 Son of Mathias & Mary S (Benner) Moore. nee Benner. 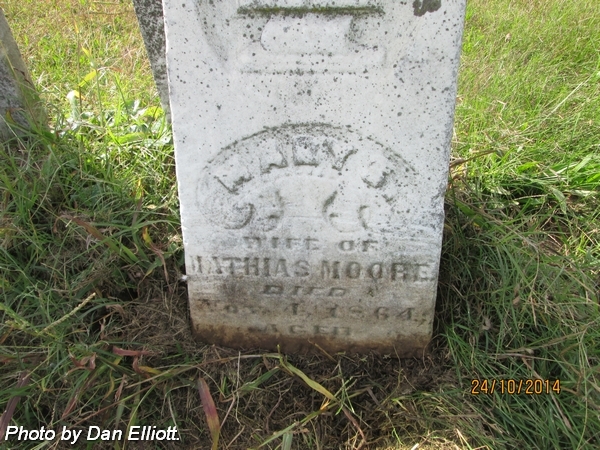 Wife of Mathias Moore. 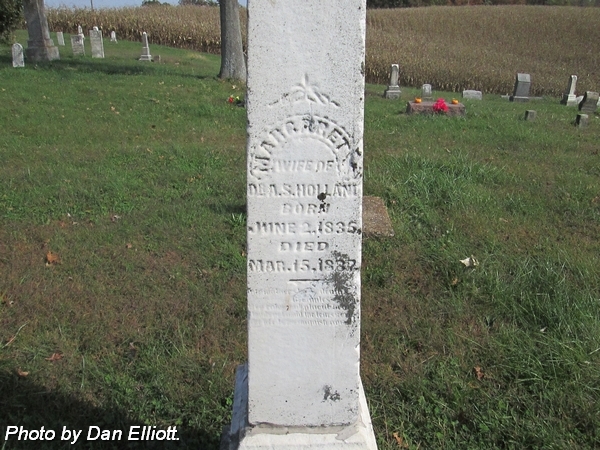 Married 13 Dec 1863.
nee Draper. Wife of David Young Mosby. 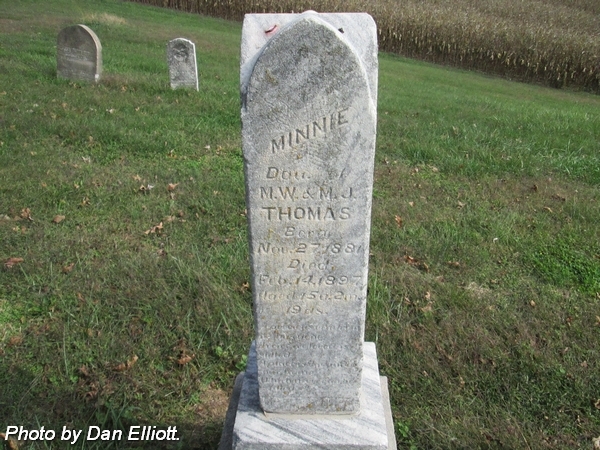 Daughter of Jesse Emerson & Minnie Florence (Cottrell) Draper. 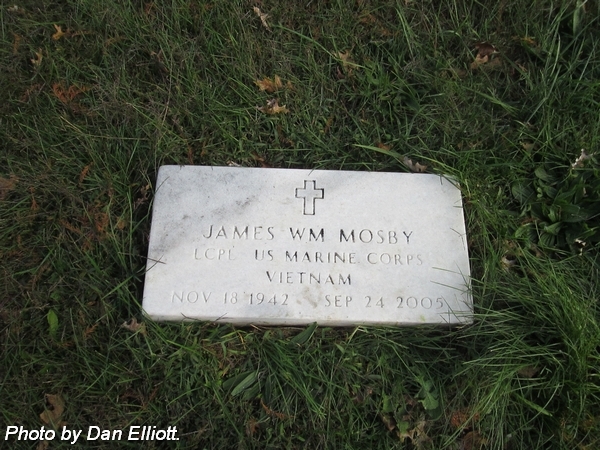 Husband of Aretha Grace (Draper) Mosby. 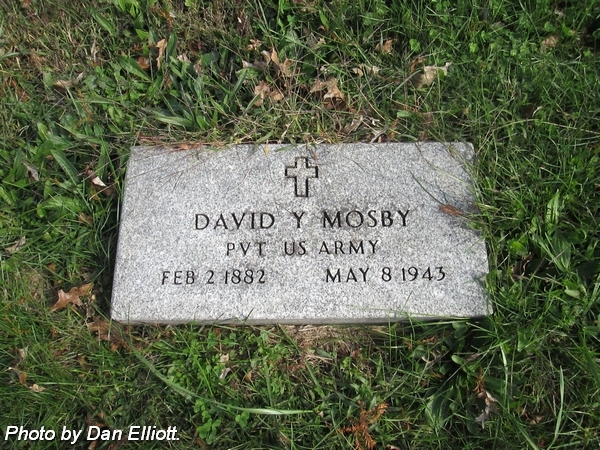 Son of David B & Sarah Ann (McIntyre) Mosby. Son of David Young & Aretha Grace (Draper) Mosby. LCpl. US Marine Corps, Vietnam. Daughter of David Young & Aretha Grace (Draper) Mosby. nee Benner. 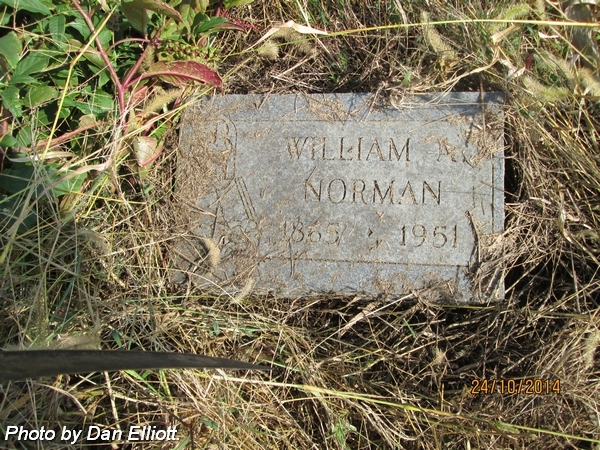 Wife of William Albert Norman. Married 13 Mar 1892 in Vanderburgh County, Indiana. Daughter of Karl Charles & Minerva “Minnie” “Mina” Wilhelmina (Schlittenhardt) Benner. 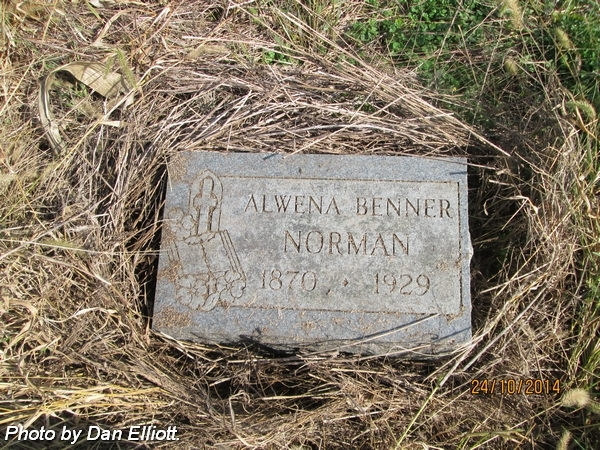 Husband of Alwena (Benner) Norman. Married 13 Mar 1892 in Vanderburgh County, Indiana. Son of W? & T Oliver. Son of Josiah & Julia (Bean) Oliver. nee Price. 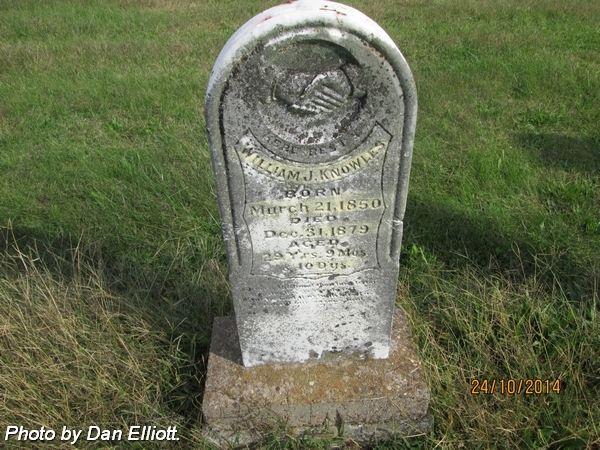 Wife of William Oliver. 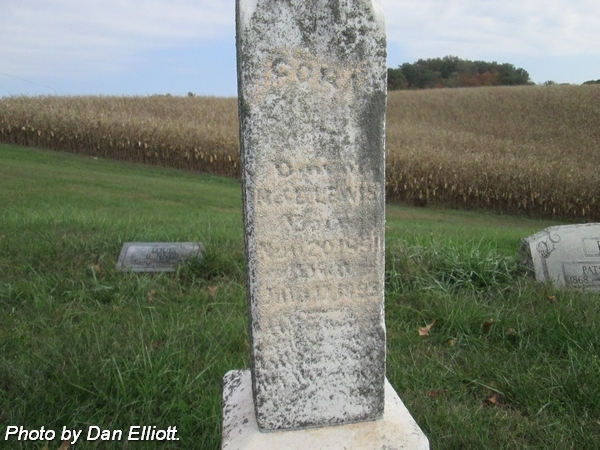 Married 20 Oct 1824. 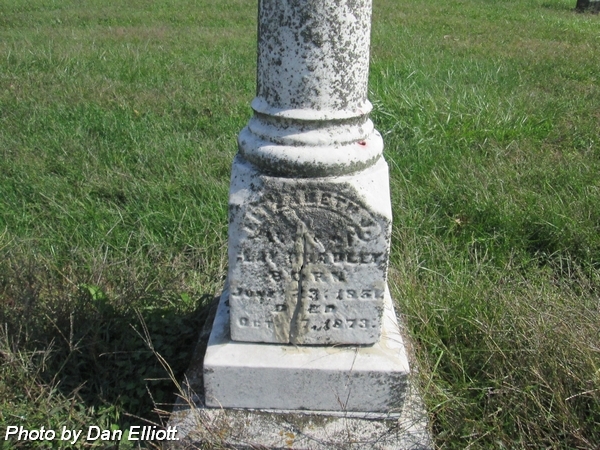 Note: Top of stone is missing; remainder is located adjacent to her husband’s monument. 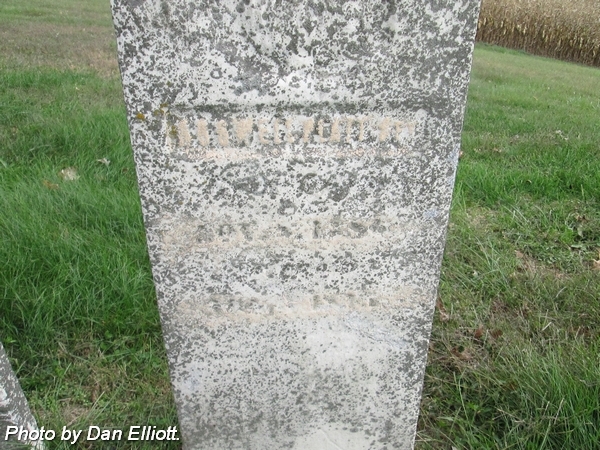 Husband of Mary (Wood) Olliver. Married 28 Oct 1869. Son of Joseph & Ruth (Downen) Oliver. 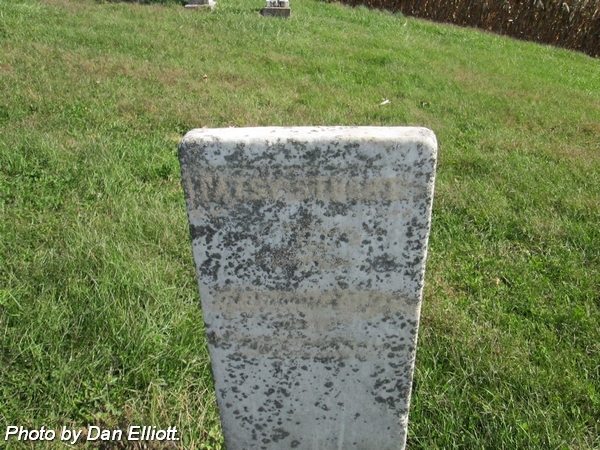 Pvt., 91st Indiana Infantry. Enlisted 10 Aug 1862. Discharged 26 Jun 1865. 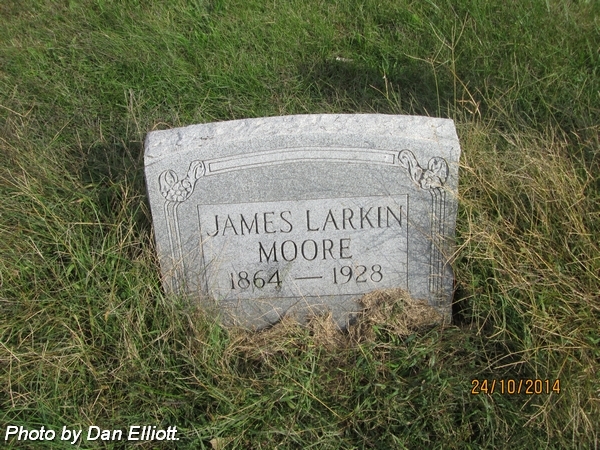 Son of Joseph & Lurena “Lureny” (Moore) Oliver. 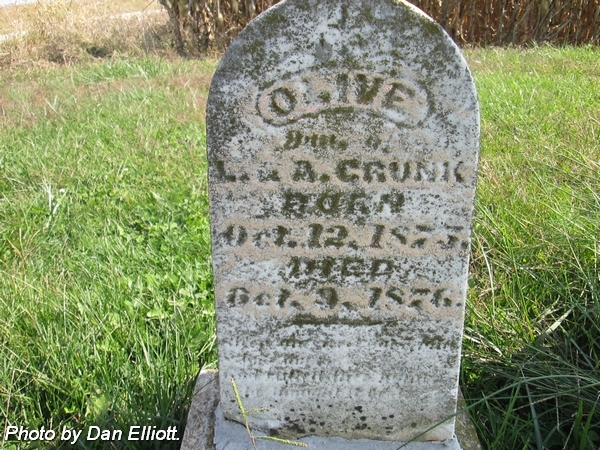 Husband of Julia (Bean) Oliver. Married 25 Sep 1873. 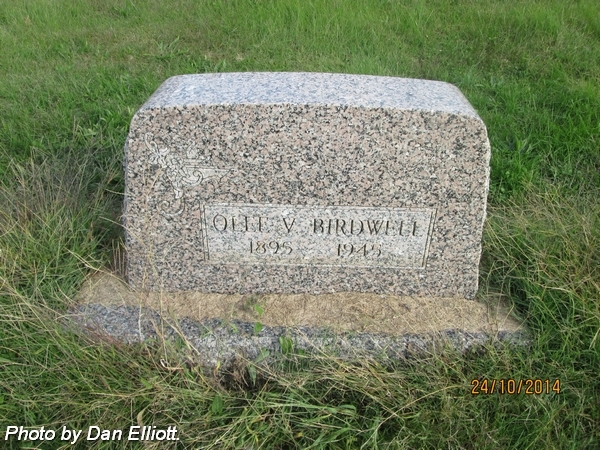 Husband of Arilla “Polly” (Price) Oliver. Married 20 Oct 1824. Son of John & Nancy J (Reese) Oliver. Aged: 64 Ys. 7 Mos. 13 Dys. 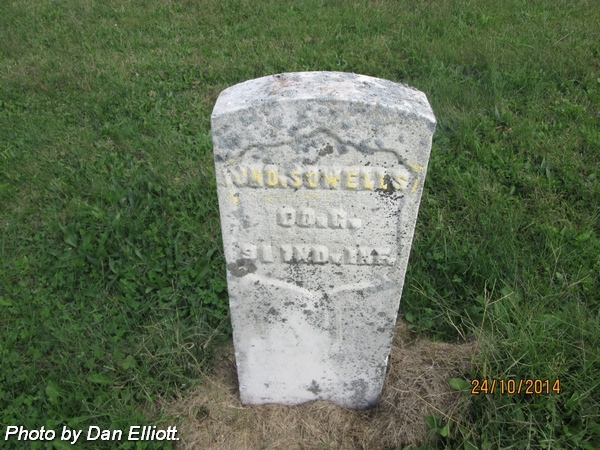 Son of James & Sarah Josephine (Harrison) Knowles Pendell. 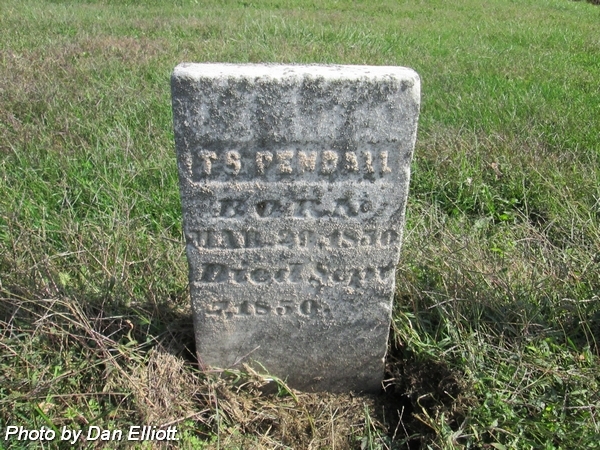 Husband of Rachel (Barton) Pendell. Married 2 Apr 1837. Second husband of Sarah Josephine (Harrison) Knowles Pendell. Married 17 Jan 1883. 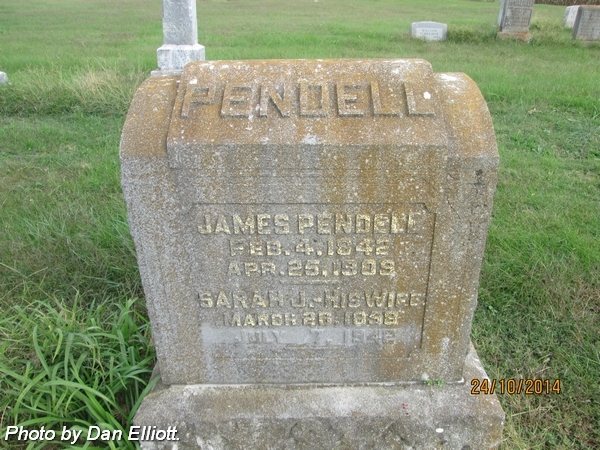 Son of Harris & Rachel (Barton) Pendell. nee Barton. 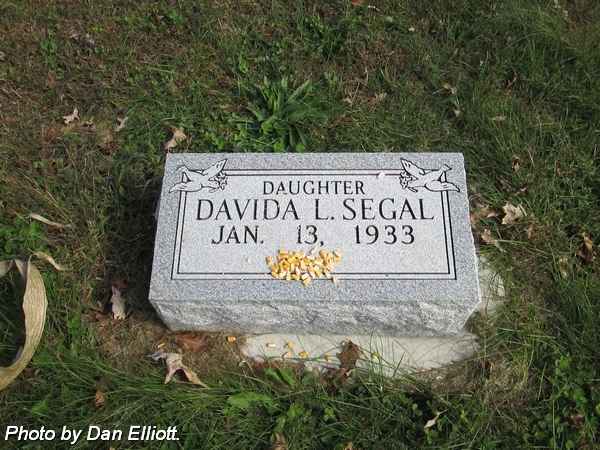 Wife of Harris M Pendell. Married 2 Apr 1837. 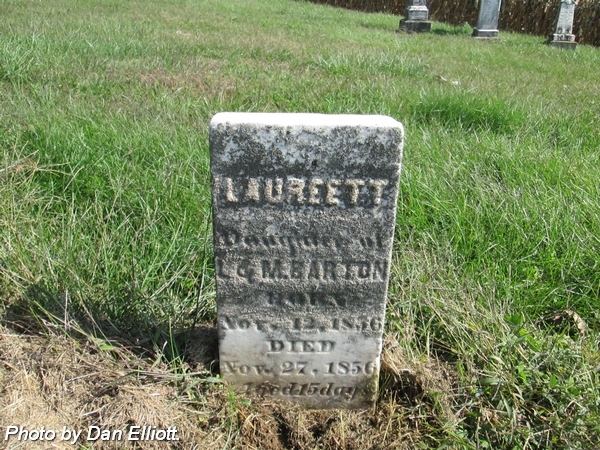 Daughter of Alexander & Elizabeth S (Lowell) Barton. nee Knowles. 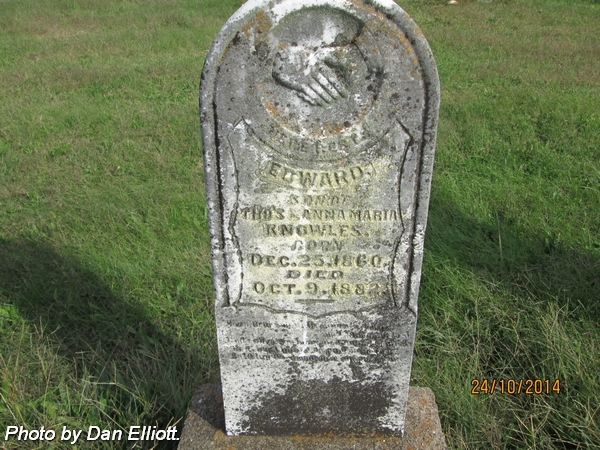 Wife of William Knowles, 1st, married 8 Jan 1874; and James Pendell, 2nd, married 17 Jan 1883. First husband of Laura (Lawrence) Pickles Stokes. Married 15 Oct 1903. 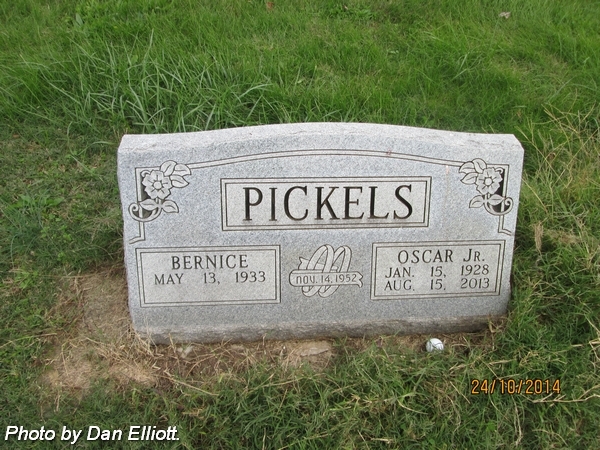 Son of Oscar Pickles & Parthena (Lawrence) Pickles Stokes. Son of William & Rebecca (Gregory) Pickles. 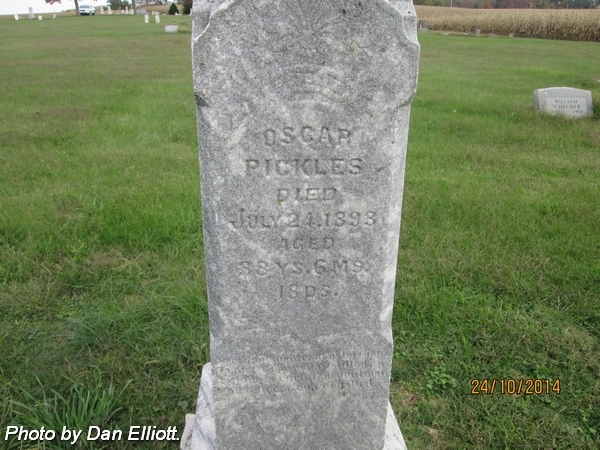 First husband of Mildred Emma (Ripplemeier) Pickels Carlisle Tooley. 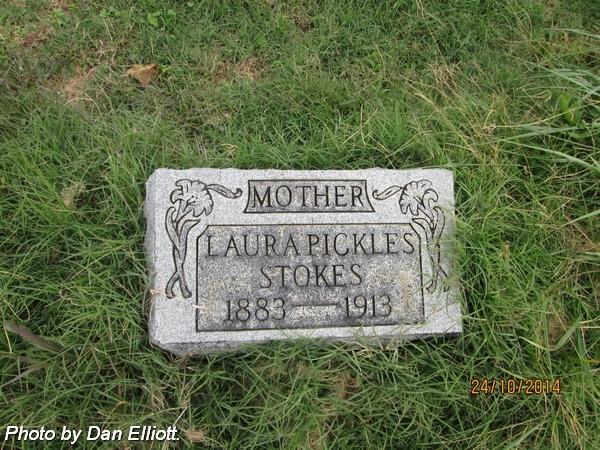 Son of William S Pickles & Laura (Lawrence) Pickles Stokes. 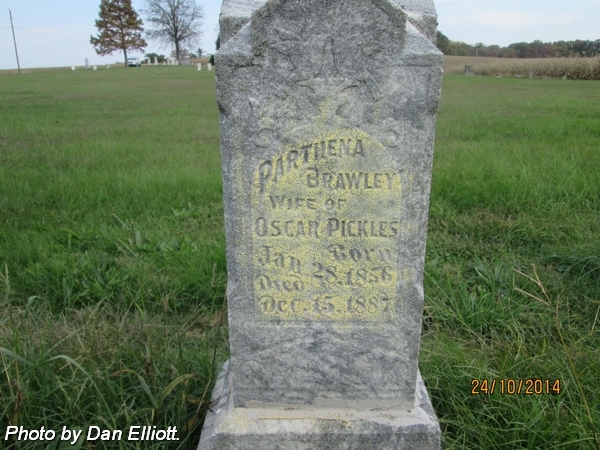 Husband of Partehna (Brawley) Pickles, 1st; and Lucretia (Downen) Pickles, 2nd, married 3 Mar 1889. Aged: 38 Ys. 6 Ms. 18 Ds. nee Brawley. 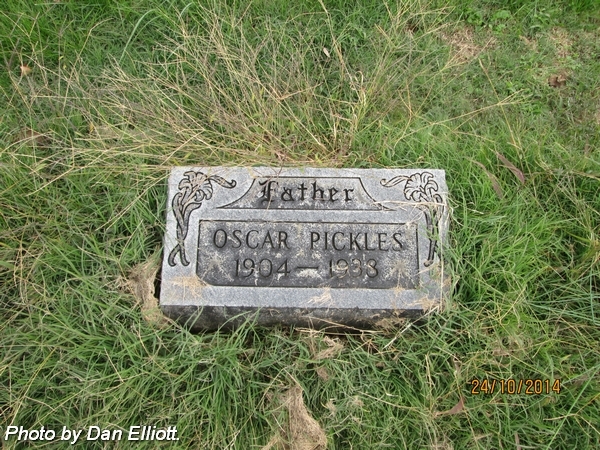 First wife of Oscar Pickles. 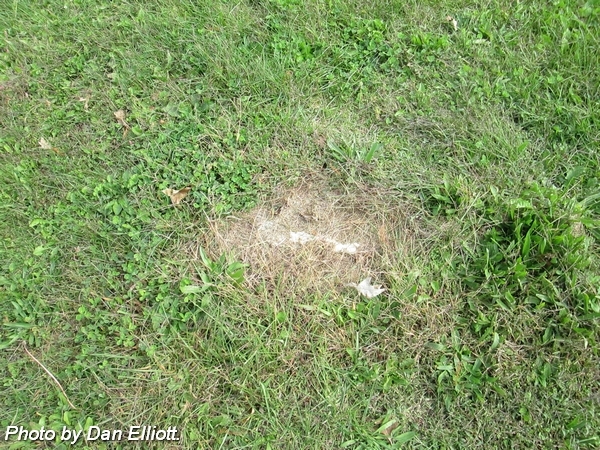 Son of Rozwell & Nancy (Wilson) Platt. 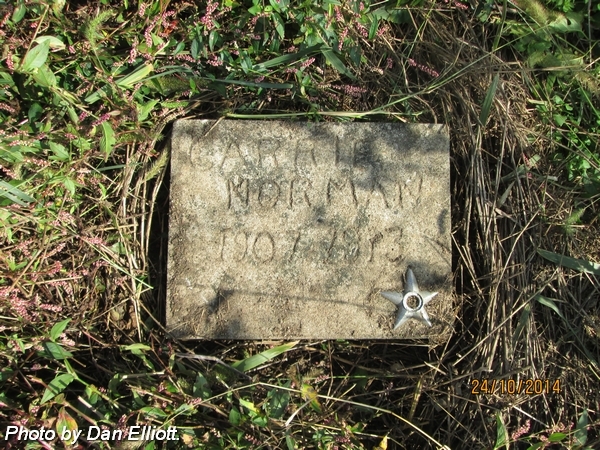 Pvt., 125th Regiment, Co. A, 10th Indiana Cavalry. 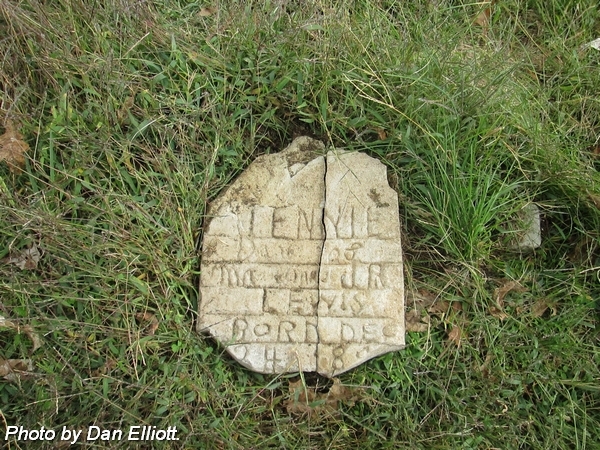 Enrolled 15 Nov 1863 at Mt. Vernon, Indiana. Age: 18. Enlisted 30 Mar 1864. 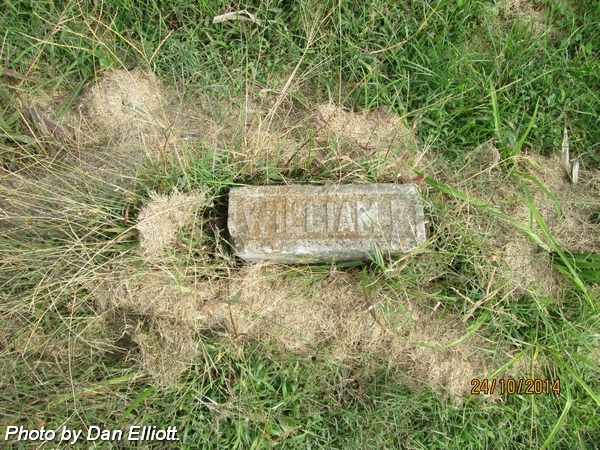 Discharged 28 Jul 1865.
nee Williams. 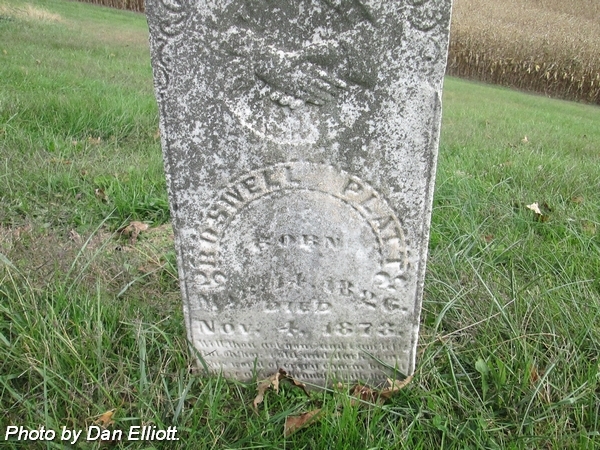 Wife of Rozwell Platt. 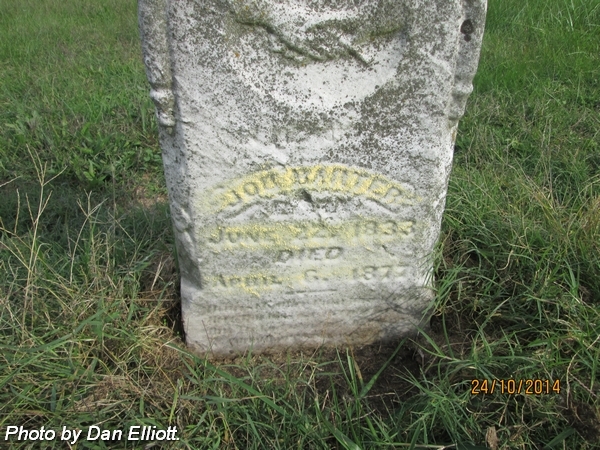 Husband of Martha A (Crunk) Platt. Married 24 Mar 1857. 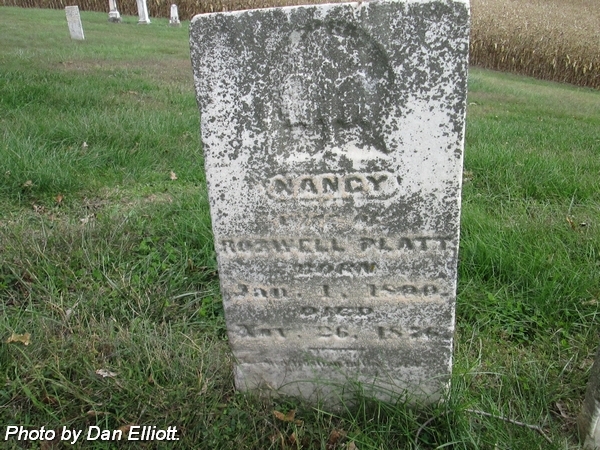 Son of Rozwell & Nancy (Williams) Platt. nee Dougherty. 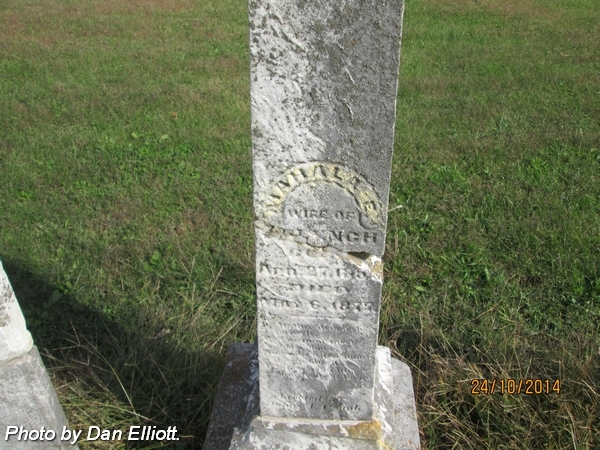 Wife of Francis Pratton. Married 12 Feb 1856. 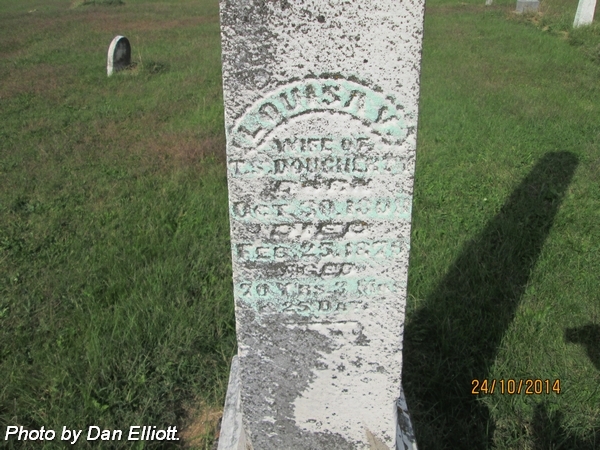 Daughter of Thomas S & Louisa V Dougherty. 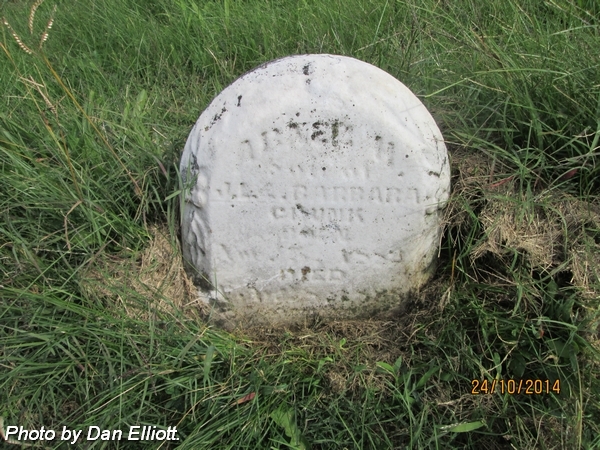 Husband of Catharine (Jakobi) Schreiber, 1st, married 29 Oct 1850; and Elizabeth (Hauser) Schreiber, 2nd, married 13 Feb 1856? 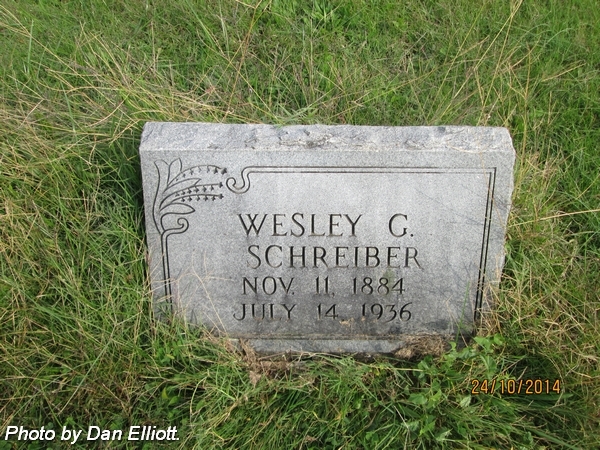 Son of John Melchoir & Wilhelmine Elisabethe (Lang) Schreiber. nee Hauser. 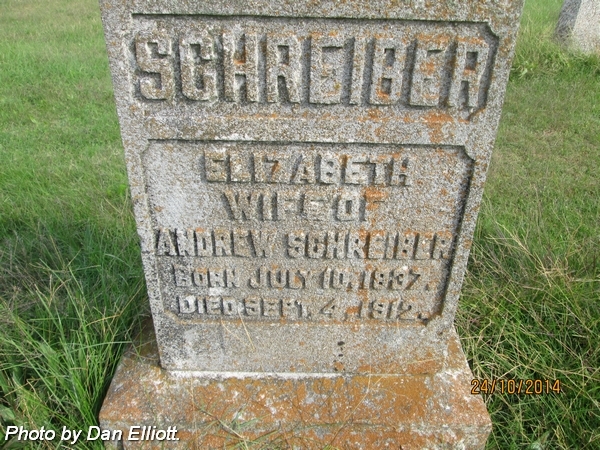 Second wife of Andrew Schreiber. Married 13 Feb 1856? nee Menikheim. 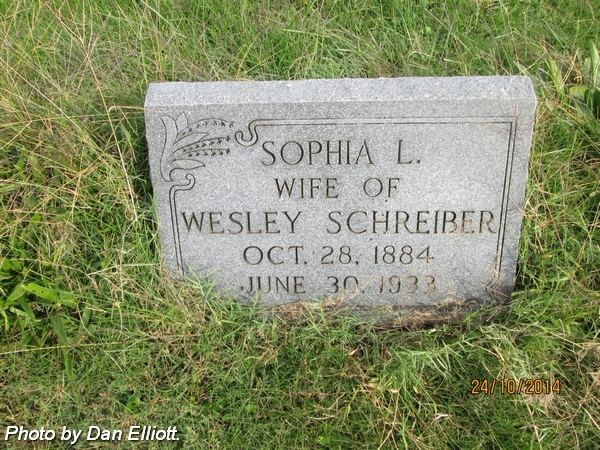 Wife of Wesley George Schreiber. Married 20 Jul 1912. Daughter of Charles & Mary (Reineke) Menikheim. Husband of Sophia Louise (Menikheim) Schreiber. Married 20 Jul 1912. 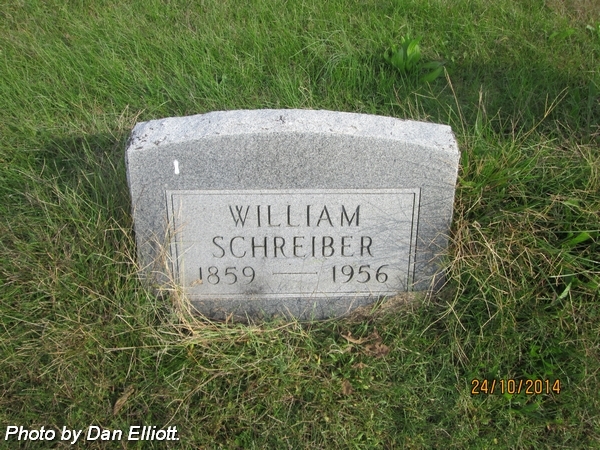 Son of William& Wilhelmina (Martin) Schreiber. Husband of Wilhelmina (Martin) Schreiber. Married 29 Jan 1884. 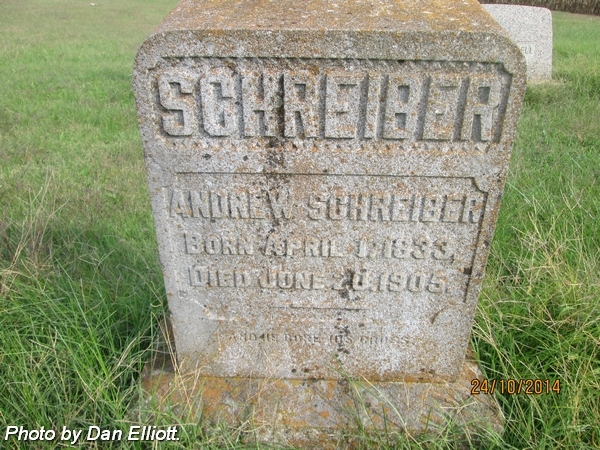 Son of Andrew & Elizabeth (Hauser) Schreiber. 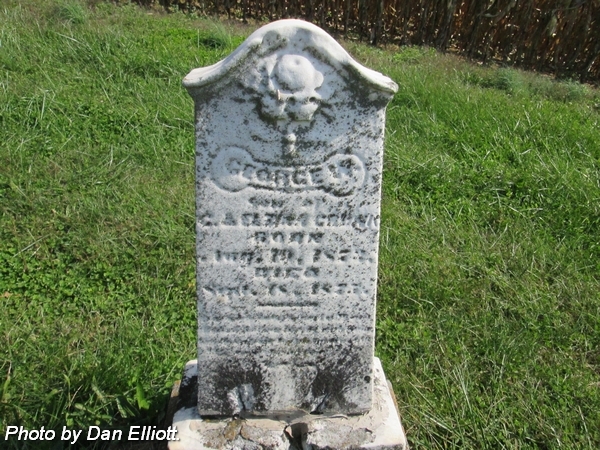 Pvt., Co. G., 91st Indiana Infantry. Enrolled at Evansville, Indiana on 12 Oct 1863. Age: 18. Discharged 29 May 1865. 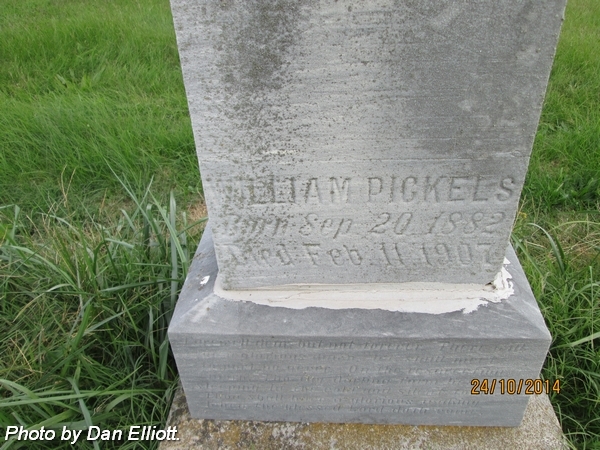 Husband of William S Pickles, 1st, married 15 Oct 1903; and Henry Stokes, 2nd, married 16 Mar 1911. 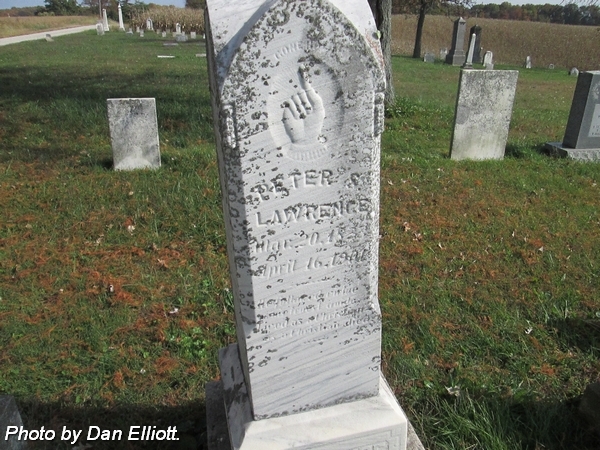 Daughter of Isaac Lawrence & Orilla Jane (Lewis) Lawrence Green. abt. 25 years of age. Son of George W & Mary E (Crunk) Thomas. Daughter of George W & Mary E (Crunk) Thomas. 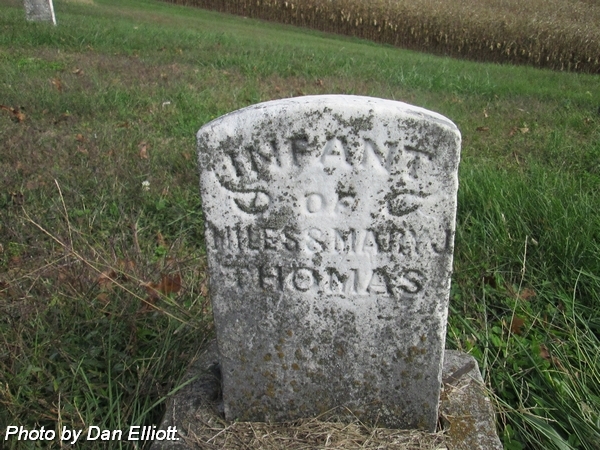 Infant of Miles W & Mary J (Lewis) Thomas. 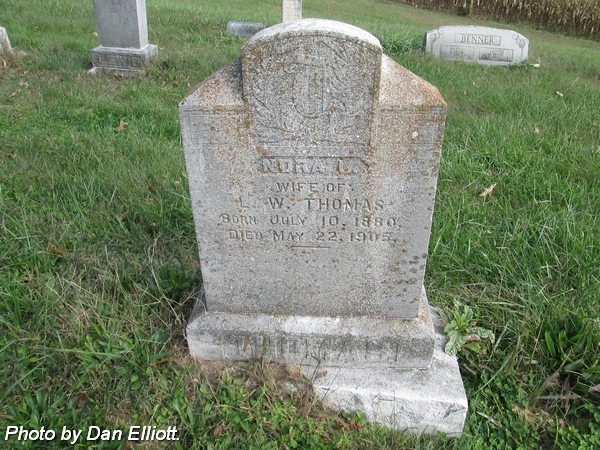 Son of Miles W & Mary J (Lewis) Thomas. 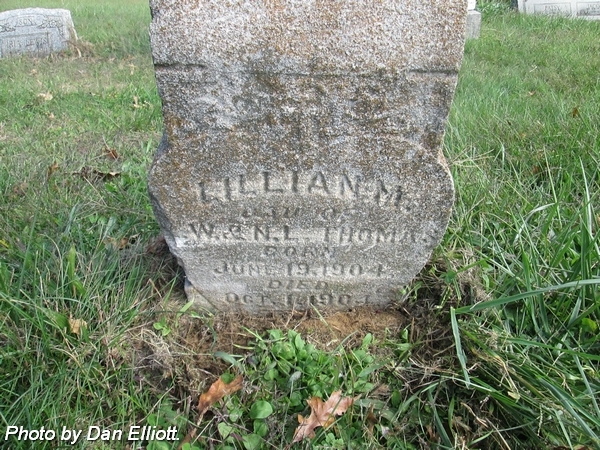 Daughter of W & Nora L Thomas. Daughter of Miles W & Mary J (Lewis) Thomas.. Aged 15 y. 2 m. 19 ds. nee Nichols. 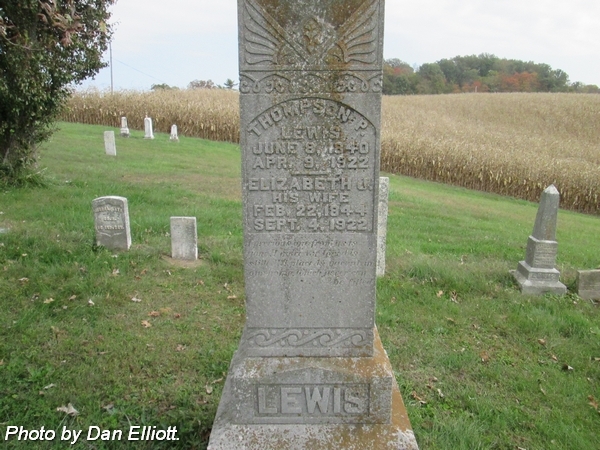 Wife of Lewis W Thomas. Married 19 Dec 1900. Daughter of George L & Amelia E (Higgins) Nichols. 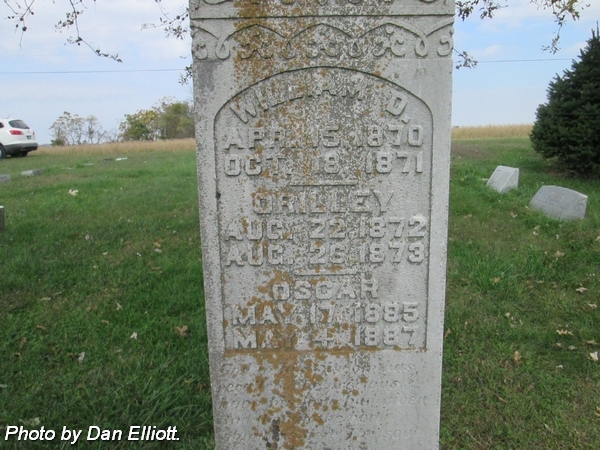 Son of John & Mary “Polly” (Oliver) Winemiller. Aged: 3 Years 8 Mo & 3 Days. 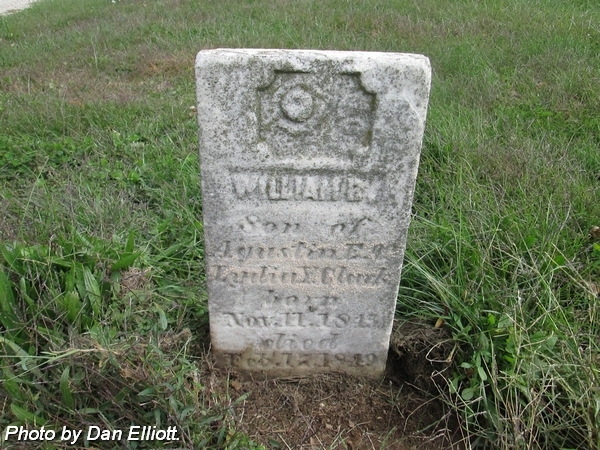 Husband of Jane (Lewis) Winemiller. Married 23 Aug 1842. 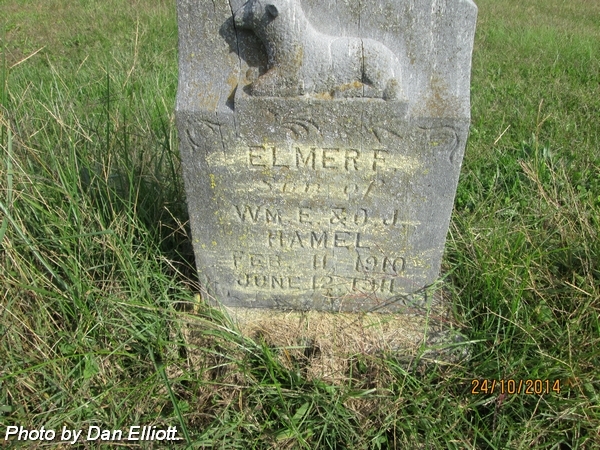 Son of Jacob Winemiller & Sally (Moore) Winemiller. nee Lewis. 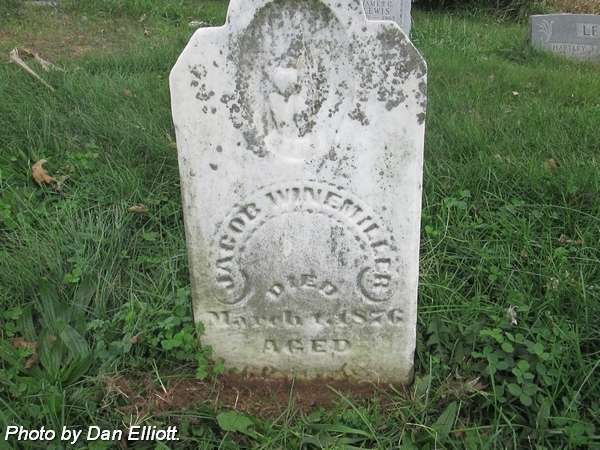 Wife of Jacob Winemiller. 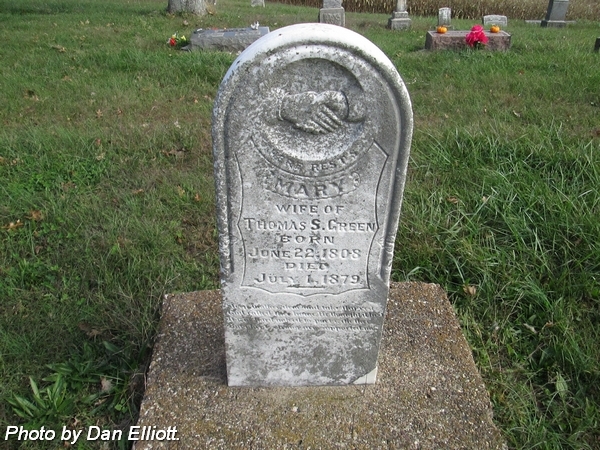 Married 23 Aug 1842. 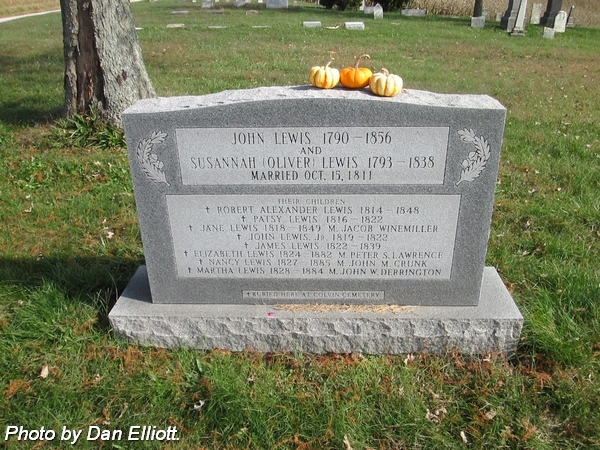 Daughter of John & Susan (Oliver) Lewis. 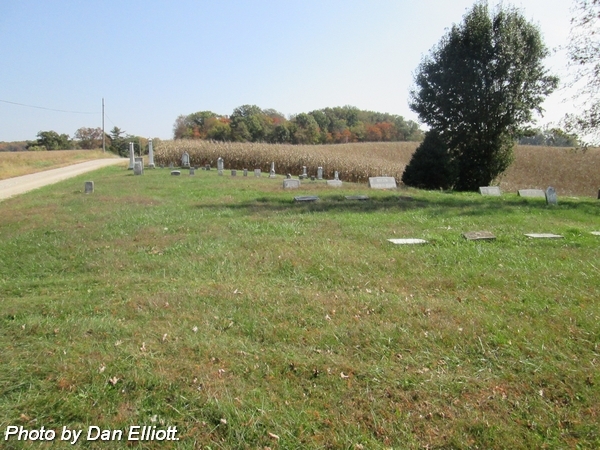 View of the east side of the Lewis family memorial monument. View of the west side of the Lewis family memorial monument.